A few extra days!!! Lots of Bargains. Up to 50% off. I'm feeling very generous today, offers welcome. We definitely WON'T be there Monday 25th March - our lease is finished. Firstly, thank you so so much to everyone who came for my "Final Weekend". It was so exciting and I really appreciate so many people coming and supporting me. I’m finding it hard to retire! We’ve cleared the cellar and upstairs looks BRILLIANT all thinned out! So we’ve decided to open for a few more days! Firstly, thank you so so much to everyone who came for my "Cutting Event". It was one of my very best nights ever and I really appreciate so many people coming and supporting me. It was a night I hope I'll never forget. I'm sorry I've been rather quiet for the last week or so. I had a very frightening eye problem but things are improving now thanks to my wonderful care at BRI. So I'm slowly getting back to things. "Mother's Day Treats" was £450, now £390! "Banksy visits Bingley" £298 can you find where he's left his mark? "Nowts changed", Bingley - charcoal paint and collage - 17x38 ins. 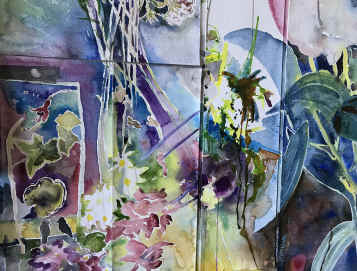 The Angel - acrylic ink and various things - 44x18 ins. WAS £350, NOW £250! Sue Sarah and a Dog - acrylic ink watercolour and gouache - 45x37 ins. wAS £450, NOW £390! We hope you will come along, join in the fun, bag yourself a bargain and enjoy the exhibition. As this is the final show (see Gallery News above) paintings may be taken away and new ones added at any time! If you have a frame to fill - bring it along and cut a piece of Jane's painting to fit! Detail from Layer 1 4x9 ft.
"This show includes an experiment- a sort of pilot for a much larger, room size idea I have been thinking of for many years. The ending of my time at the gallery feels a fitting time to take the plunge and do it. I'm not quite sure what will happen but it will be interesting and hopefully fun." As well as the experiment there will be a new collection of Jane's paintings. Many are from the Life Room but a large flower study and a semi-Janescape, among other things, have crept in too. The Angel - acrylic ink and various things - 44x18 ins. Sue Sarah and a Dog - acrylic ink watecolour and gouache - 45x37 ins. 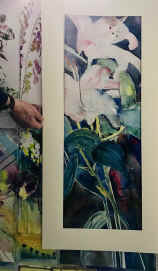 ... two large bright paintings on silk. The Helpful Cat, the Lazy Cat and the Teatowel with a Mind of its Own 21 x 27ins. Light on the Landing 29 x 37 ins. ... some strange found creatures! For several years now I have garnered the precious findings from window sills. Their moment of glory has arrived. 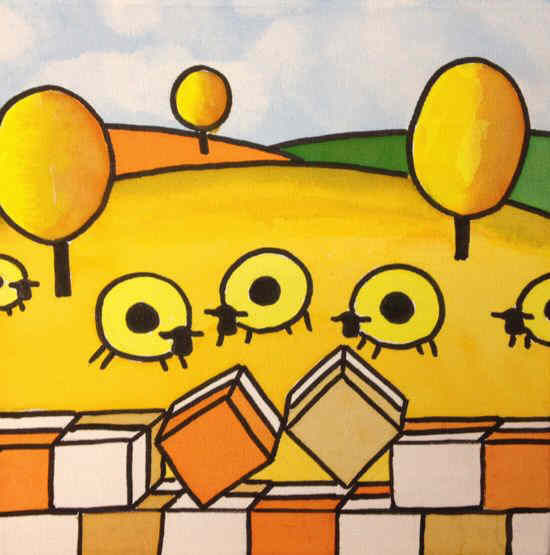 Eight small framed creatures are ready to share and begin their life afresh. Thank you "Light on the Landing" for guiding me to these. ... and finally a few fun light box clouds! My latest Janescape, completed a couple of weeks ago, just in time for the Christmas Show -phew! I have so enjoyed painting a series of these little landscapes. 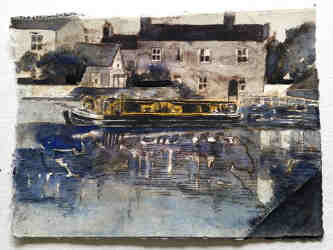 This year Amy's been exploring Bingley and painted this beautiful view across the river. I know Amy has been working hard on her latest robins and wintery birds and her family will be delighted when they've left their living room and flown to Bingley! Gemma Hobbs’ work is always interesting and gives you plenty of food for thought. 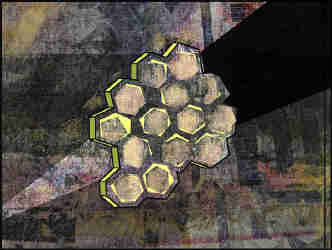 Her latest pieces from the Hive Mind series include work on aluminium and reworked palettes. And Gemma's even had some lovely JIGSAWS made from Honeycomb Ray . and specially for Christmas some more little tiny ones from me. 10 Beautiful Bingleys – 49x121.5 cm. 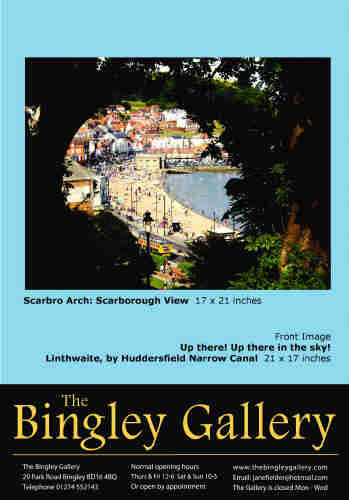 "I'm really excited about this one off collection of favourite snippets, that highlight the beauty of Bingley"
1. The Speeding Cyclist 2. Defiant Washing 3. 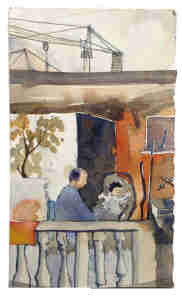 Food - 34.8x95.2 cm. "I've had great fun chopping up Ireland Bridge to make this unique triptych." These two details from "The Best Balcony" go well together in their black frames. 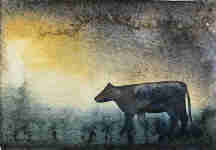 Contented Cows, The Happy Couple, The Rowan Tree - Bingley" - 97x45 cm. I got the idea for "Contented Cows, The Happy Couple, The Rowan Tree - Bingley" from a customer who asked me if I would put 3 Bingley Janescapes in a vertical frame. What a good idea. Thank you Jason! "And specially for Christmas I've made 3 TINY ones at just £20 each! I love that cow that sits under the tree in the field between Sleningford Road and Five Rise Locks ..... well, while there is a wall between us"
I feel so fortunate living in such a beautiful place and would be delighted if you and your friends can join us at the opening this Wednesday October 17th 7-9pm and help us celebrate Beautiful Bingley. We hope you will come along and enjoy the exhibition. 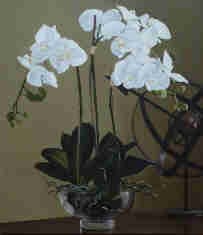 For a few weeks, we are putting on a special show of some of Jane's own favourite flower paintings. Thursday 7th September 2018 for 5 or 6 weeks. For the summer, we are putting on a special show of several new artists, and revisiting some of Jane's work. FREE Gallery Talk Monday August 20th 3 - 5 pm. 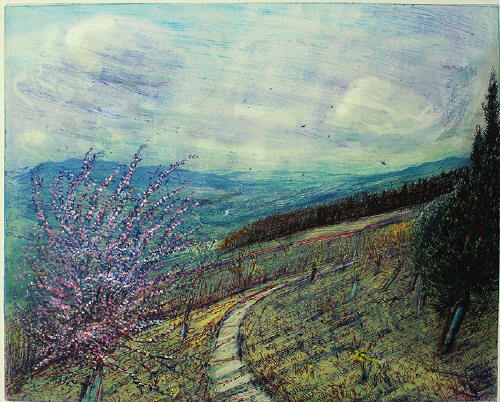 "I have been predominantly working with the Yorkshire landscape since the mid 1990’s and tend to return to the same places again and again as I try to establish a relationship with the space through drawing and painting it over time. Ideas often begin with me sitting in a field working directly from nature. Back in the studio I make spontaneous gestural works in colour on paper trying to make sense of what I was experiencing on site." “Mask” found objects 51 cm. Objects originate and evolve over time, even millennia, and yet ultimately return to what they came out of. ARCHAOS explores the duality of creation and decay. It's about the evolutionary process - the evolving complexity, intricacy and sophistication of what is created - alongside the decay, destruction, dismantling, reduction of things back to their origin. These landscapes encompass two geographic extremes. The views of Yorkshire moorlands and hillsides all lie within about mile or so of each other, and within walking distance of my home on the outskirts of Haworth. 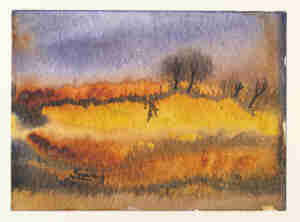 They result from sketches made during repeated walks on the moors. The others are far flung, ranging from islands in the South Atlantic – South Georgia, Bird Island, Signy – to mountains in northern Sweden. These arise from my other life, in science, studying the interactions of ocean, atmosphere and polar climate. It is a privilege to travel and work in, some of the most remote and beautiful environments in the world. I rarely have time to sketch these in the field, but the thousands of photographs I have come back with provide the source material for many of the images in this exhibition. Torn between studying art and science, Ian opted for a degree in physics, staying on for a PhD in atmospheric physics. Since then he has worked in academic science, and is currently a professor in the Institute for Climate and Atmospheric Science at the University of Leeds, where he studies atmosphere-ocean interactions and polar climate. 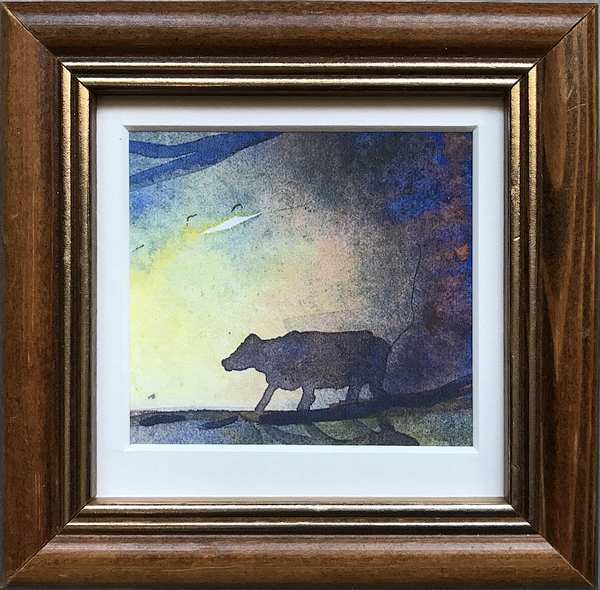 After being introduced to etching by a friend a few years ago, he has found the technique to be a perfect match for stark landscapes of the remote polar regions to which his scientific work takes him, and those of the Yorkshire Moors closer to home. The environment influences her work. 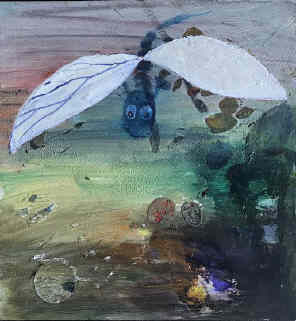 She enjoys experimenting with different techniques particularly collage to convey the essence of whatever grabs her attention at the time – birds, views, people and more abstract ideas including the signs of the zodiac. In order to express the flow of energy and movement and thoughts and feelings, she uses line, colour, texture and words in whatever medium seems appropriate - acrylics, pastel, collage, ink, watercolour. Tim Hales was born in 1947. He enjoyed an eye-opening education at Leeds Art College in the late sixties where he met many creative and inspiring people. He subsequently found work as a colour planner in industrial lithographic printing, but this led to a working life which had very little to do with creative art. 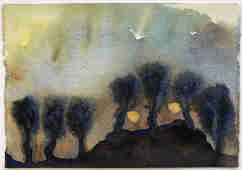 He continued to draw and produce cartoons, but only occasionally dabbled in painting. Since retirement he has resumed this first love and is now determined to make up for lost time. Tim works mostly with acrylic paint on board. His paintings are abstract at this time, but he likes to make ambiguous references to landscapes or figures that could be read in different ways by the viewer. 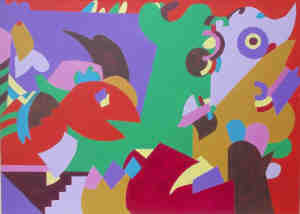 He obviously likes to work with strong bright colours, and hopes that his images are entertaining and playful. Among others he particularly admires the work of David Hockney, Francis Bacon and Alan Davie, but has sometimes been disenchanted when they have stolen his ideas. 6 January - 18 February 4 March 2018. Our once a year chance to snap up an art bargain, from our favourite artists. 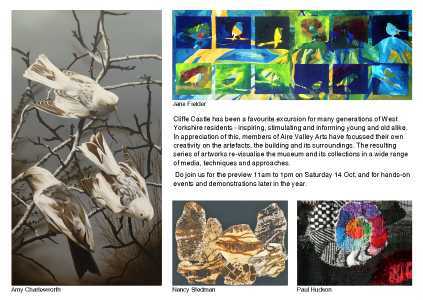 Jane is a proud founder member of the "Aire Valley Arts" association of artists, who are showing this major display of artwork to celebrate and respond to Cliffe Castle. Cliffe Castle has been a favourite excursion for many generations of West Yorkshire residents - inspiring, stimulating and informing young and old alike. In appreciation of this, members of Aire Valley Arts have focussed their own creativity on the artefacts, the building and its surroundings. 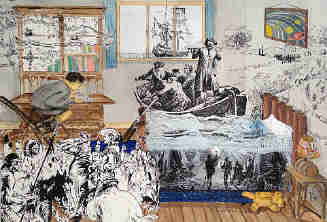 The resulting series of artworks re-visualise the museum and its collections in a wide range of media, techniques and approaches. "For over 30 years Cliffe Castle has been one of my family’s favourite places to visit. With three young boys, with three young cats, frequent gleeful visits were made to present the taxidermist with out latest find. Birds and mice were common ‘gifts’ but there was the occasional rat and once even a rabbit that they had somehow managed to drag through the cat flap! The children proudly presented their carefully wrapped precious gifts to the helpful person at the desk, who without fail appeared eager and friendly, promising to pass them on to the taxidermist. So revisiting Cliffe Castle years later with AVA to decide what to focus on for our upcoming exhibition I was instantly drawn to the collection of stuffed animals and birds. 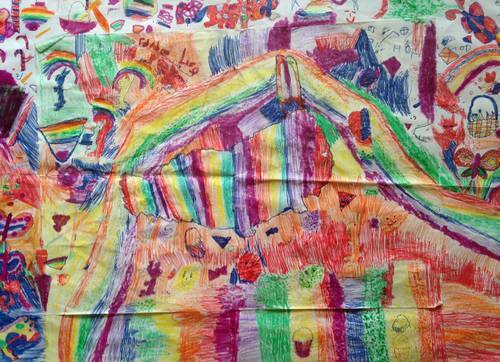 As Cliffe Castle was always associated with fun and play I decided to have fun with the art work and see where it led me." 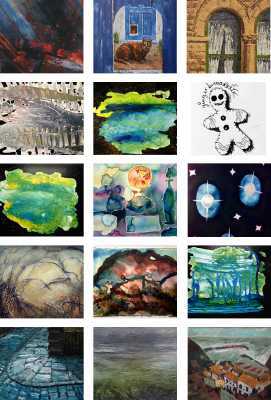 Paintings by Jane Fielder, Amy Charlesworth, Josie Barraclough, Simon Dobbs & other artists. Look what's just arrived! Kate Shearwood's amazing driftwood sculptures. Jane submitted three of her Janescape paintings, and is thrilled that all were accepted and are now on display in Cartwright Hall. Prizegiving event: Sunday 11 June, 1 - 3pm. All welcome. The Bradford Open is an unrivalled showcase for the district’s artistic talent. Works on show have been selected from artists and craftspeople who live or work in the Bradford District. Work is for sale so a great opportunity to support local talent and purchase a unique piece of art. 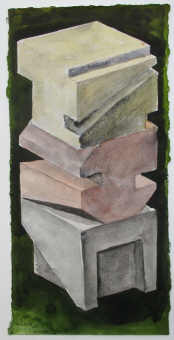 Oil, watercolour and acrylic paintings, sometimes with a surreal edge. Mainly figurative: landscapes, rural & urban, and portraits. 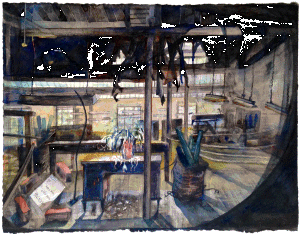 Dan paints traditional landscapes in watercolour, as well as vibrant oil still lifes and street scenes. Occasionally he paints directly from the imagination and creates work with a surreal slant to it. Dan grew up in West Yorkshire and lived in Bingley for eight years. 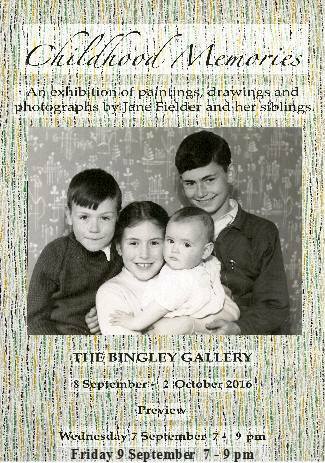 PREVIEW on Wednesday 4th October 7-9 pm at The Bingley Gallery. Jane Fielder and David Greenwood look closely at the wonderful landscape around Bingley where they live, in this new collection of paintings. Many of the paintings are from the same spot, but seen through different eyes. 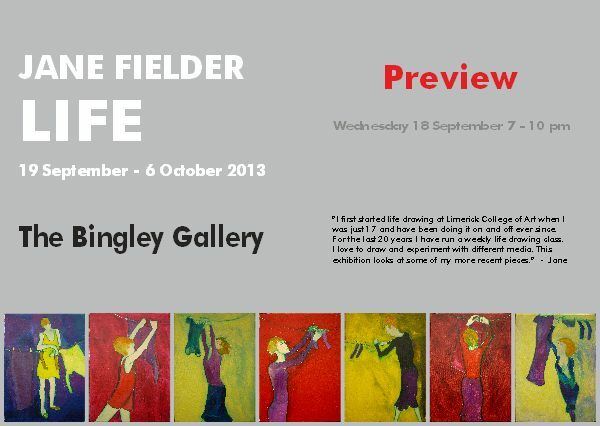 PREVIEW on Wednesday 13th September 7-9 pm at The Bingley Gallery. 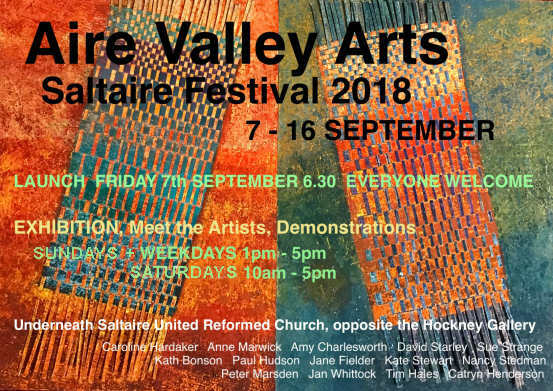 As a part of this year's Saltaire Festival, Jane and her companions in the 'Aire Valley Arts' group will be running a 2 day event. 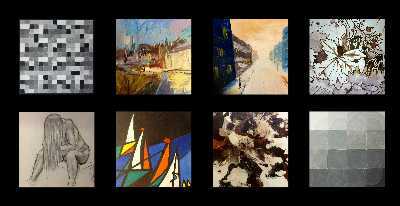 Set in the canteen of international electronics group Arris within Salts Mill itself, a fantastic range of paintings and art works will be on show and available to purchase. Refreshments will be availabe from the canteen too. 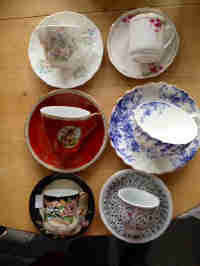 Come for tea or coffee, and a snack. Enjoy the work. There will also be a schedule of demonstrations of oil paintings by one of the AVA members, with a chance to have a go yourself. Open Saturday 9th and Sunday 10th September 2017, 10am to 5 pm. For the summer, we are putting on a special revisit to some of Jane's work. 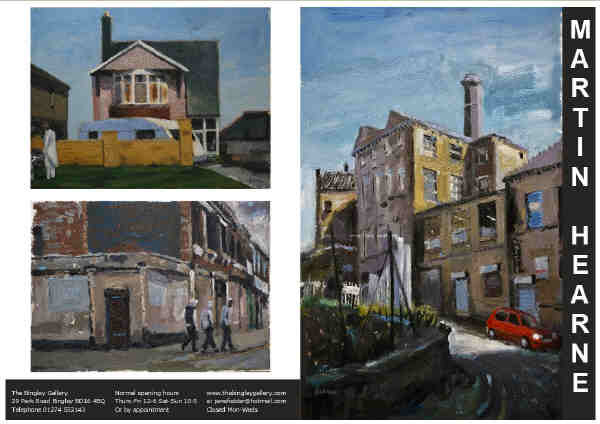 "These new paintings of street scenes show a Bradford created by light and shade. They show people going to and from work, waiting for the bus, shopping etc. 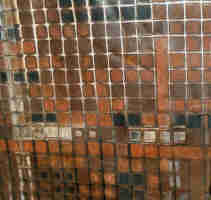 or focus on a particular quality in the city buildings. 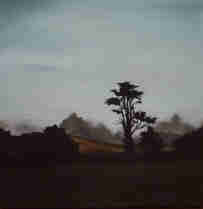 Often the paintings reveal a landscape made memorable by a particular quality of light or time of day." 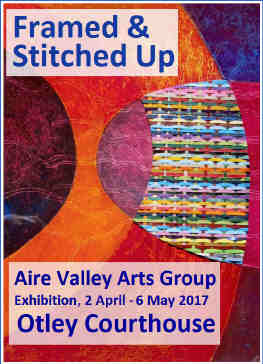 Jane together with her co-members from the Aire Valley Arts association will be displaying a group show in The Otley Court House centre. Not on trial of course, the Court House is now an Art and Resource centre. 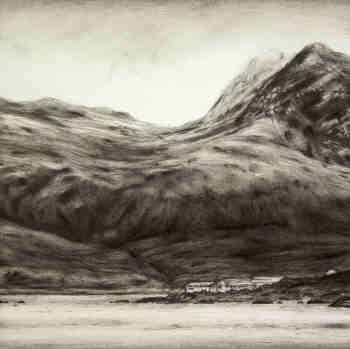 Tony's beautiful paintings in graphite, capturing Yorkshire's windswept splendour. Although firmly rooted in Thornton, he travels and works worldwide, and returns from his home in Thailand for this show. 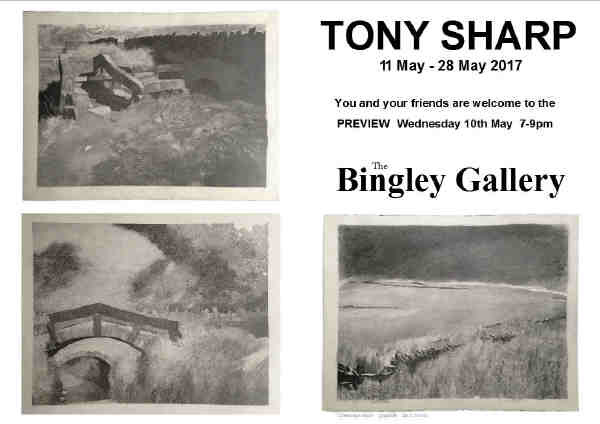 Tony's PREVIEW on Wednesday 10th May 7-9 pm at The Bingley Gallery. 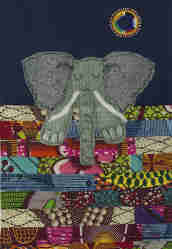 Designed textiles for Heals, Cavendish (John Lewis), Fidelis, Sanderson etc. 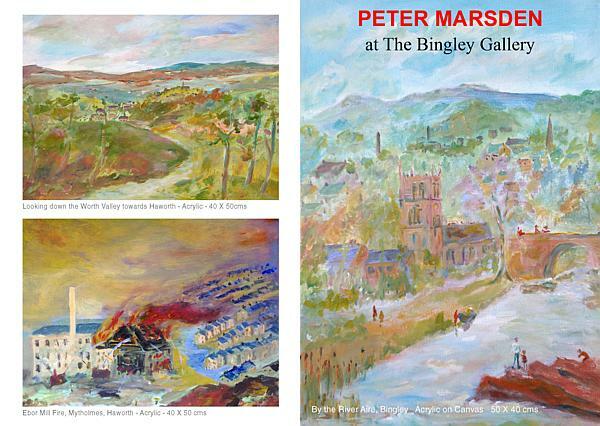 Peter's PREVIEW on Wednesday 5th April 7-9 pm. Now we are really looking forward to Chris's show. He's been experimenting with interlocking structures, concrete dyes and embedded objects, and we are eagerly awaiting seeing his new work in the flesh! 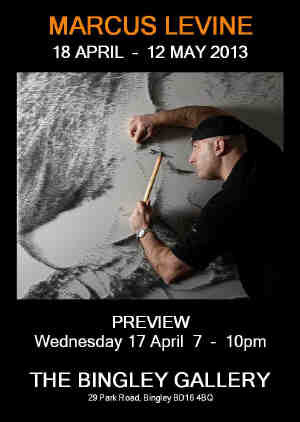 Chris's PREVIEW on Wednesday 8th March 7-9 pm. Paintings and textiles, by Jane Fielder, Amy Charlesworth, Jean Ford, Kate Stewart, Janet Brown, Nina Greenwood and others. 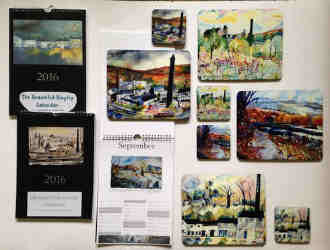 Plus a new selection of coasters, cards, placemats and calendars, many depicting "Beautiful Bingley". Just look at these treasures that have been delivered for our Christmas Show today. The most wonderful textile work by Kate Stewart. Intricate desk screens and beautiful hangings, all embroidered in the most exquisite colours. 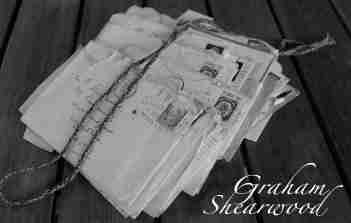 They would make the loveliest Christmas presents and are so light and easy to post. Then the most detailed and imaginative work I think I have ever seen. I'll just show you two but there are more, painted in watercolour and gouache by Janet Brown who is new to the gallery. The more I look at them, the more amazed I am. Do look closely, you will not believe it! 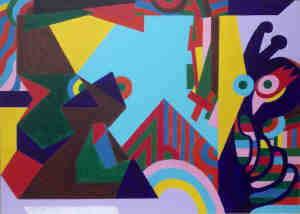 In contrast to Janet's very detailed work are Jean Ford's playful canvasses many inspired by liquorice allsorts! They are delightful and such fun. 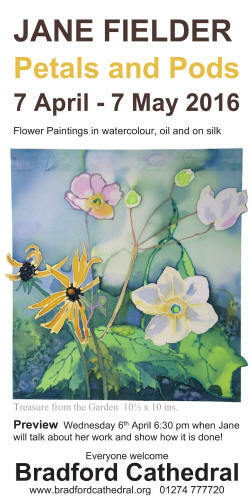 I shall be showing some new flowers painted on silk, and some 'sparse' trees, plus a few surprises. 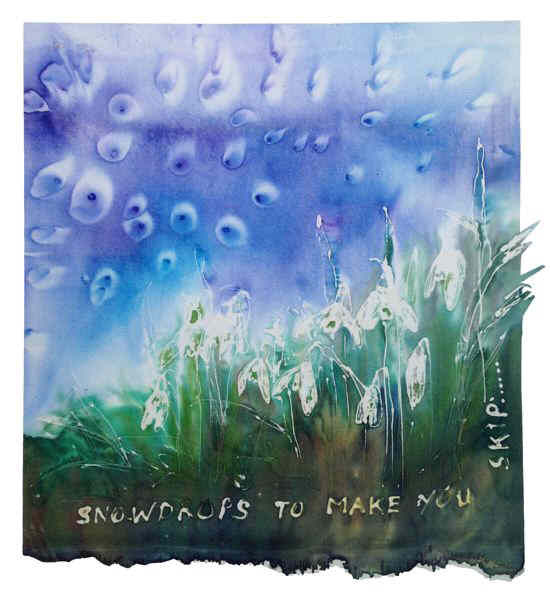 Snowdrops to make you skip Jane Fielder Paint on silk 12x12 ins. And finally, our resident artist Amy Charlesworth has been busily working away and has lots of treats in store. 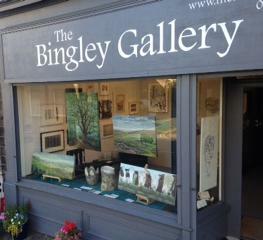 Including a magnificent oil painting of The White Horse, Bingley, some cows and birds and who knows what else?! We're only a 5 minute walk from Bingley Train station, do pop in if you can. 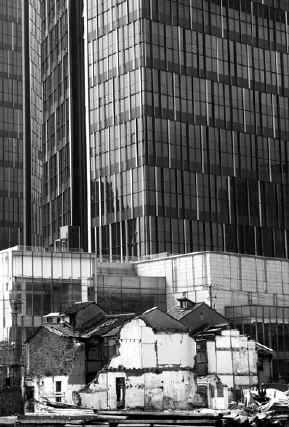 An exhibition of Janescapes, including some which explore the demolition of the Bradford and Bingley Building Society building, plus a new series of abstract work. The Best Balcony Bingley watercolour 11 x 60 ins. We're really looking forward to the preview on Wednesday 5th October from 7 - 9pm. and would love to see you. "Treasure this precious world. Nothing must be wasted. I feel compelled to create beauty from the discarded scraps. These paintings are about that." 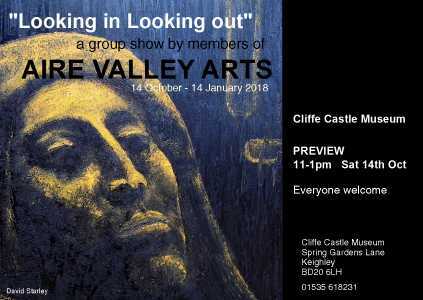 Jane together with her friends from the Aire Valley Arts association that she is a member of, will be having a group show in Richmond's Station Gallery. Click here for more information. 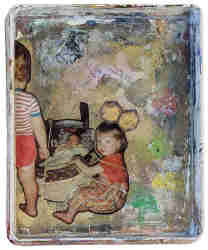 The siblings remember their childhood, in paint, photograph and verse. There are 2 special previews at the gallery, that I'd love you to come to. 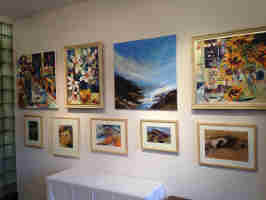 They are about my family's CHILDHOOD MEMORIES ( paintings by me and my brother Ian, photos by my older brother Graham, '?' from my sister Lizzy, maybe even a song or two from her husband!) the first one is on Wednesday 7th September 7-9 and then we're having a second one on Friday 9th September when loads of cousins will arrive! Everyone is welcome to either or BOTH. part of The Saltaire Festival 2016. 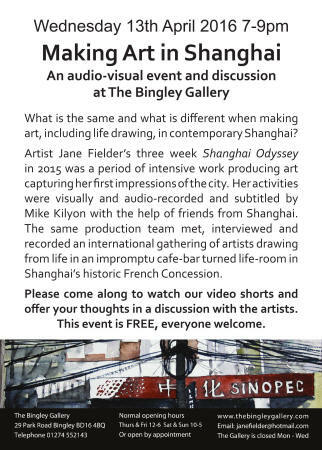 ‘Shanghai Odyssey’ is an exhibition of Jane Fielder’s paintings and Mike Kilyon’s art photos, all produced in Shanghai in 2015. 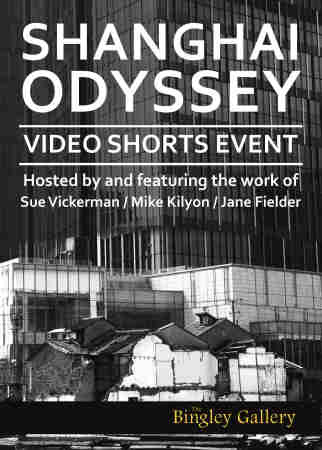 There will also be a showing of film shorts (3-4pm Sat & Sun) and poetry by Sue Vickerman. Photography of Manningham Mill prior to its conversion to cool apartments. 'Janescape' pictures in print, with a special HUGE canvas on display. 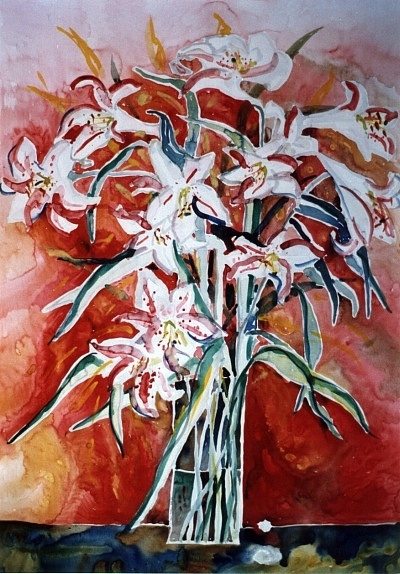 Original paintings in watercolour featuring some favourite flowers. 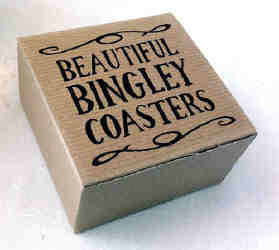 And of course, coasters, cards and placemats showing Bingley in its glory. 7 April - 7 May, Cathedral opening hours. 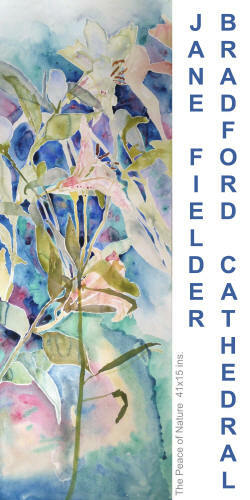 I am delighted to have been invited to exhibit my floral work in Bradford Cathedral during April and May this year. Such an inspiring venue! It is great to be promoting the arts in Bradford through the Cathedral’s successful Arts and Music programme. a lovely setting for my flower paintings! About a year ago, one of my friends, Sue Vickerman, poet, novelist and artists model, burst into the life room in great excitement, declaring she was going to Shanghai for a year, "You’ll have to come Jane. You could paint, you’d love it." the seed was planted. I dreamt of painting, artists exchanges, exhibiting…. The work I completed whilst in China was shown at a wonderful exhibition I had in Shanghai, but I have completed several more pieces since coming home that I am thrilled to be showing for the first time at The Bingley Gallery, along with the original pieces. 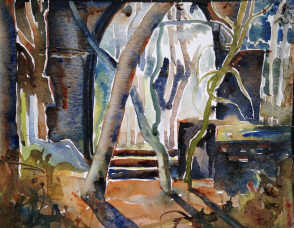 A Secret World I Watercolour 49.5 x 36 cm. Watercolour and pastel 48.5 x 36.5 cm. AND during this Shanghai Odyssey show, we shall be having a special audio-visual event evening, featuring Video Shorts about Shanghai and our creative endeavours there. 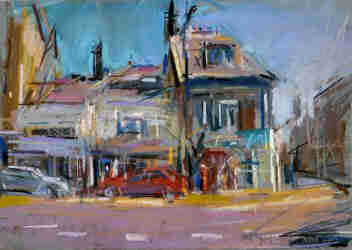 Videos and slide shows by Mike Kilyon about his and Jane's work in this exciting city. Everyone welcome. Locale, a show by a fellow life-drawer and talented artist and musician, Phil Moody. 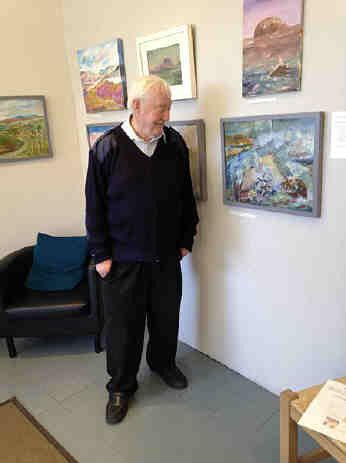 Phil’s show explores the local landscape and its inhabitants and as ever his passion and energy shine out. I have known Phil for some years and at life drawing on a Thursday night he can be found darting about frenetically, scribbling and mark making at high speed, making wonderful drawings. Sometimes he even animates his drawings after creating them on his iPad, bringing his gestural work to life even more! Other exciting news…. the Islington based Millinery Works Gallery have invited Jane and good friend Kate Stewart to show five pieces of work each at their Contemporary British Exhibition which previews on Sunday 31st January 2016 and continues until Sunday 28th February. For the Millinery Works invitation, with addresses, times and full details, please look here. 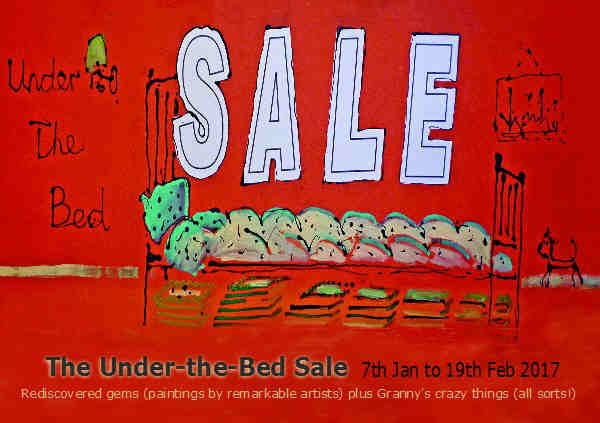 I have been busily framing and getting ready for the Under the Bed Sale, which previews on Saturday the 9th January and it is SO exciting seeing the work ready to show for the first time. In the process of finding work for Under the Bed I have discovered all sorts of pieces I had almost forgotten and I know the other artists in the show have found their own hidden gems which I cannot wait to see. This year, just as a one-off, I thought it would be fun to share my late Mum's treasures that have been accumulating 'under beds' and in every nook, cranny and horizontal surface for over 90 years! 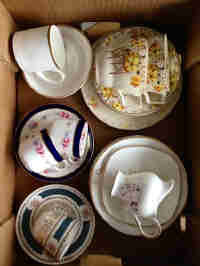 There are 100s of things and they will all be going at silly prices, so I can get some painting space back! So do come and have a root. A sample of Mum's treasures, I'm afraid I'm not sure if they'll all be in the sale as some may have already gone to charity shops or found good homes. There are so many I really can't remember! We’re now frantically preparing for our Christmas Show which opens at midday on Thursday 29th October. Our resident artist Amy Charlesworth is working on a new collection of her much loved Robins and I’m just putting the finishing touches on some new water colours of Bingley. Each year we spend many hours making “Beautiful Bingley” calendars. 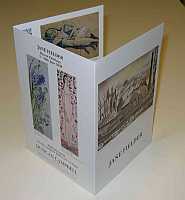 Every calendar is hand made and each one is individually designed so no two are ever the same. We have a new selection of coasters and placemats too and are even getting some special boxes printed for the coasters, so they make really unusual gifts. 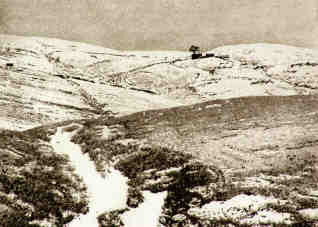 There will be special Bingley Christmas cards too. 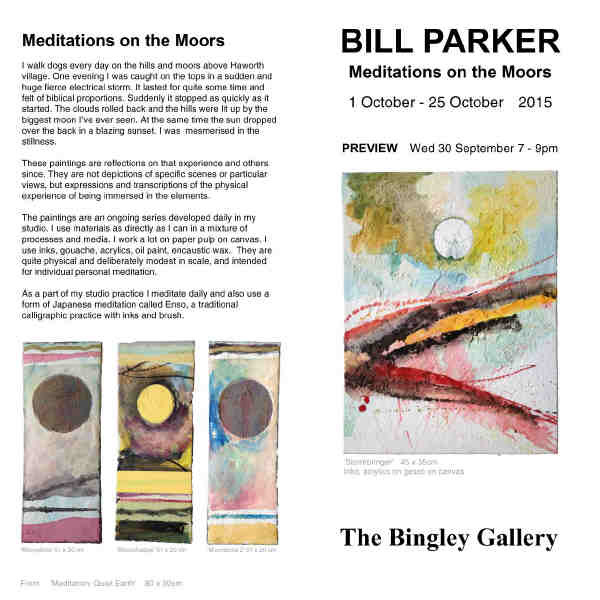 Bill's paintings are heavily sculptured multimedia on canvas producing a colourful and almost tactile representation of his subject, the local moors and their moods. 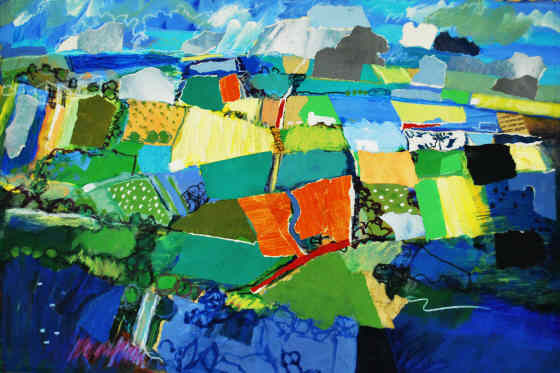 We feel extremely lucky and honoured to welcome Piers Browne to The Bingley Gallery in September. 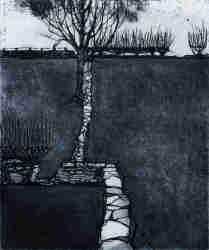 He will be showing a collection of his superb etchings, including several that have been done specially for this show. 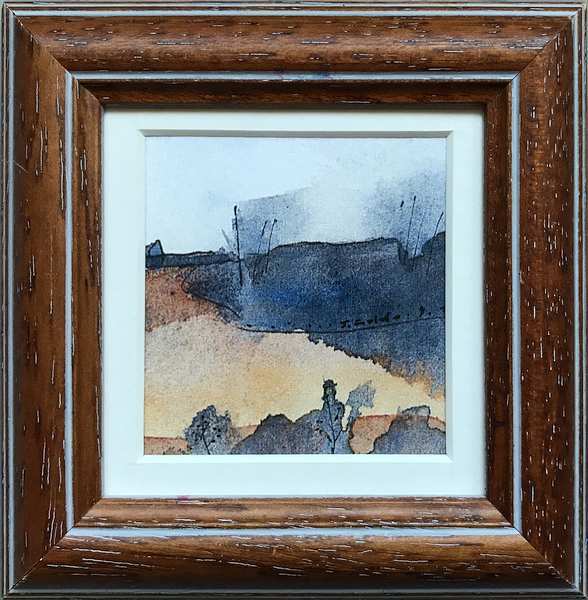 PIERS BROWNE is intensely motivated by landscape light in beloved Wensleydale, be it scudding across hillsides or say glinting through shade in woods where even there the panoramic backdrop of the dale often appears. For relief from landlocked green shades, he now often turns to seascape painting. 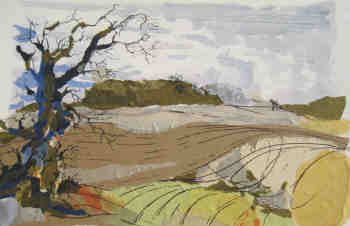 Half Piers' psyche is to let rip on very large canvases even, but on small ones such capturing of weeps of panoramic sky and allied shadows over land or sea is possible; while the other half of every landscape painter is analytically led, to tackle and fully understand minutest detail. 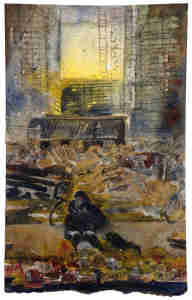 So when both attacks combine and there is also, as the painting continues, some small focus discovered, then Piers' pictures really live and work. But nothing works unless the love, the initial inspiration, is passionate. 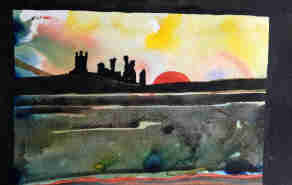 But after over 40 years painting, Wensleydale never ever ceases to inspire him. Capturing changing light on unchanging beautiful form is like a loving artist who paints his cherished wife every day of his life - just as Bernard Dunstan RA at 90 still does: Bernard originally taught Piers at his first art school in London from 1968. 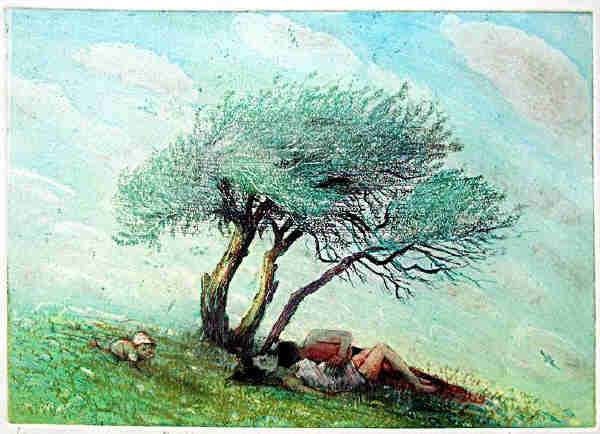 Having had 100 exactly One-man's Worldwide, PB was made Painter of North England in the prestigious ING Discerning Eye show in London, 2011, and 'PAINTER OF THE NORTH' in the 2012 Great North Art Show, and regularly shows at the RA Summer Exhibition and New English Art Club in London. 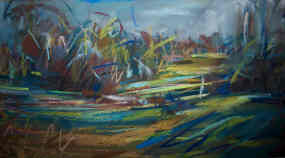 His aim is to bring fresh air and exciting compositions into anyone's sitting room on any dank, dark British days! Piers Browne will be giving a free talk about his work this Sunday 27 September at 3:30pm. 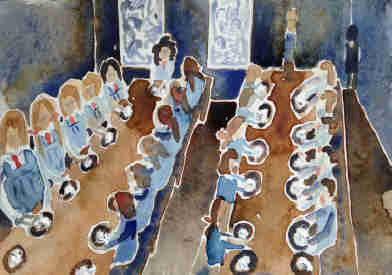 We have loved having Piers' uplifting work at the gallery, but sadly this is the last week. We have had loads of visitors, all wanting to know how he does it. So as a kind of Grand Finale, at 3:30pm this Sunday, Piers will be giving a talk about this. We hope you can join us for talk, tea and biscuits! Midnight the night before opening, nearly done! 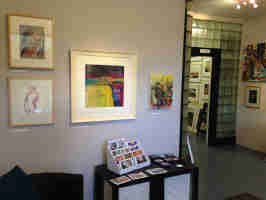 A special display of Jane's originals and some prints in the front gallery. 6 Aug to 30th September. Never got onto the website proper. 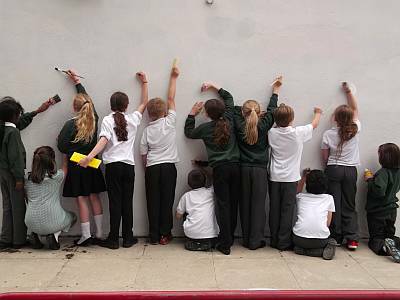 A while back, a wonderfully bubbly 9 year old called Daisy asked me if I'd judge an exhibition she'd arranged at Lady Lane Park School. It was such an uplifting occasion and she was so enchanting and enthusiastic that I decided to ask her if she'd like to have a show at the gallery. She jumped up and down with glee and said she'd love to. It has been such a joy to work with her especially as she has arranged everything! from choosing a theme, collecting the entries, to coming to the gallery to measure up for balloons and bunting! What fun. 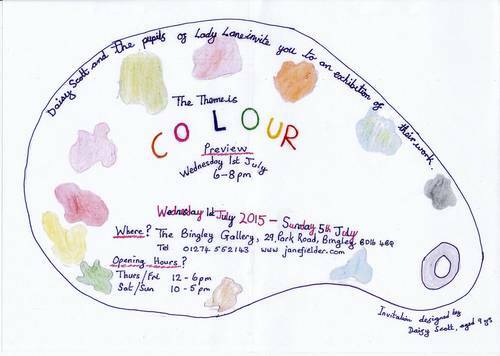 The theme is COLOUR and the preview is this Wednesday 1 July 6 to 8 pm. Do come and join us for wonderful art work, refreshments and fun. We'd love to see you. And don't forget to wear your BRIGHTEST MOST COLOURFUL CLOTHES! 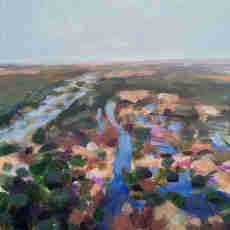 We're really proud to be showing this collection of Doug Binder's 'glowing' oil paintings. Doug is a highly influential artist and great supporter of other artists. He is currently painter in residence at Dean Clough and runs a weekly session in the life room, where he works on his almost 'magical' creations. "Barbara Place, Mary Johnson-Green, Josie Barraclough"
The preview evening is Wednesday 6 May, from 7 to 9 pm. 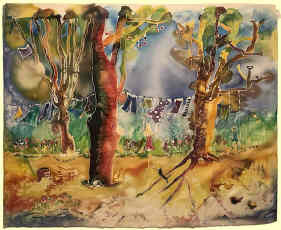 This picture was selected, out of thousands of entries, for the Sunday Times Watercolour Competition, and exhibited in the Mall Galleries, London. 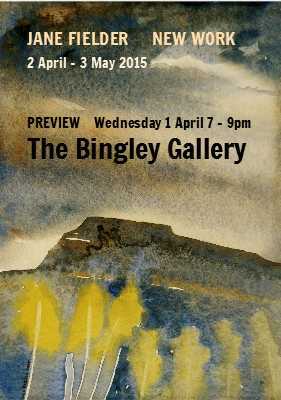 The preview evening is Wednesday 1st April, from 7 to 9 pm. 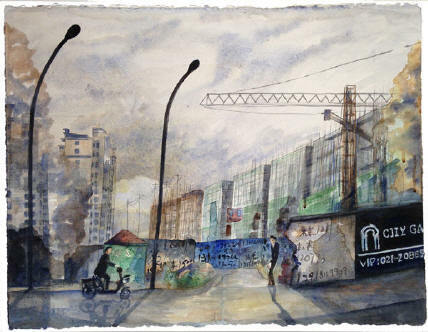 With Jane's quirky urban landscapes, known to all as Janescapes, explorations of Ingleborough, and the first outing in the gallery of Jane's entry into the finalist's show of the Sunday Times Watercolour Competition. 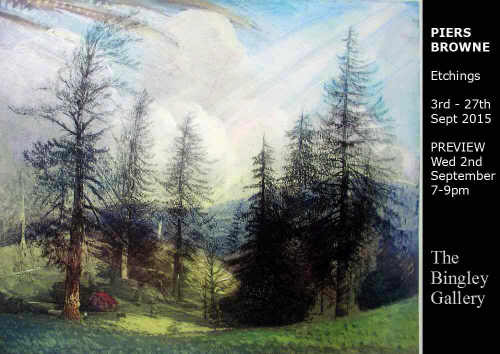 "Celebrating 89 years of Painting"
Stephanie was born in Lancaster in 1926, and grew up in the Furness District where she developed her appreciation of landscape. She trained as a nurse and midwife but much later, attended the Warrington School of Art and became a pupil of William Turner of Manchester. 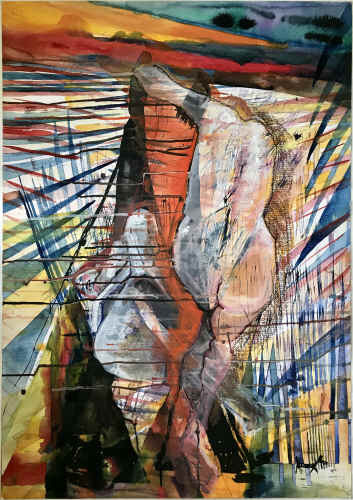 She has exhibited at the Royal Cambrian Academy, Manchester Academy (1987 Prize winner) Stockport, Warrington, and Crewe Art Galleries. 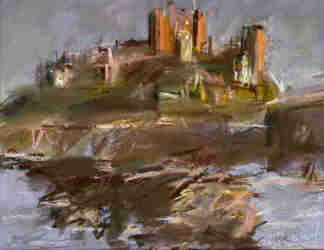 Represented in the Rutherston Collection, Manchester City Art Gallery and the Halifax Building Society and in numerous private collections in the UK and overseas. Hours Tues-Sat 10-4pm, Sun 11-3pm. Special opening Sunday 30 Nov, 11:30 to 2pm., everyone welcome. 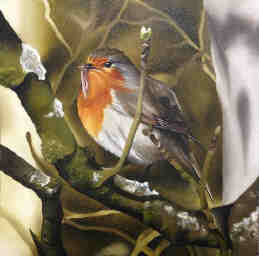 Aire Valley Arts Group exhibit a wide variety of work based loosely on the theme of "Presence" for our Christmas Show. 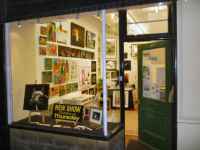 Aire Valley Arts is a group of professional and semi-professional artists centred around the Aire Valley of West Yorkshire, in the North of England. 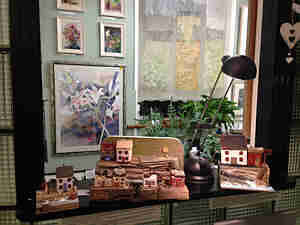 Jane is happy to be showing with her fellow artists in this stunning newly opened Mill location. various artists. 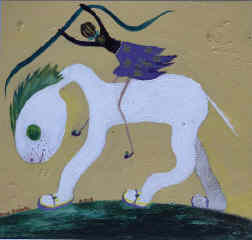 Paintings, ceramics, gifts, cards. December open every day to Christmas Eve, plus Fri 26, Sat 27, Sun 28 and Wed 31 December - Thur Fri 12‑6, Sat Sun Mon Tues Wed 10‑5, except Wed 24th 10-4, Wed 31st 10-4. 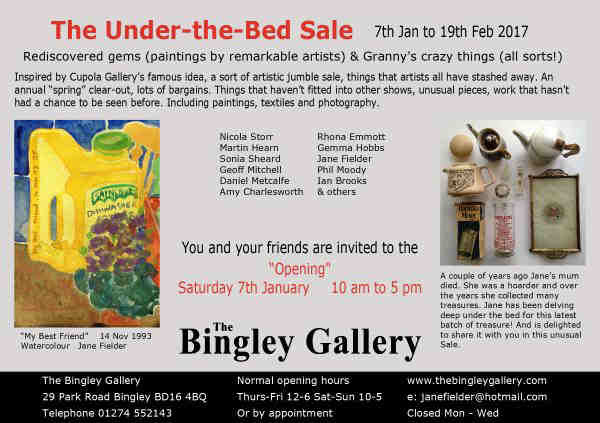 - all feature in the Christmas Show, now on at The Bingley Gallery. The preview evening is Wednesday 8 October, from 7 to 9 pm. 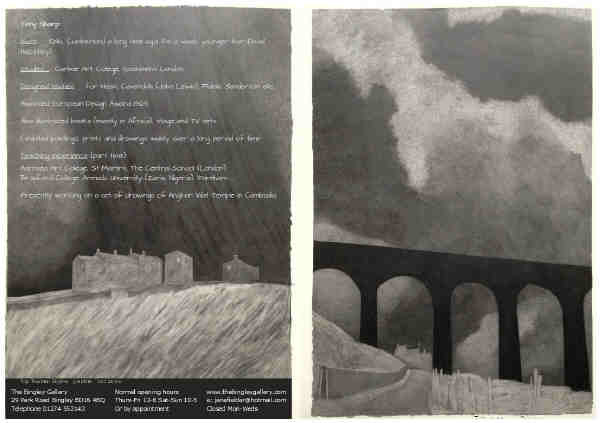 A new series of drawings, paintings and prints by Calderdale artist Angie Rogers, responding to the experience of the transient and the intangible within the South Pennine landscape. The preview evening is Wednesday 3 September, from 7 to 10 pm. Growing up in the Cotswolds, Jane developed a love for the wild flowers that grew there abundantly in the limestone meadows. This love never left her and she returns again and again, through her art, to capture their beauty and fragility, their exquisite shapes, patterns and subtle joyful colours. 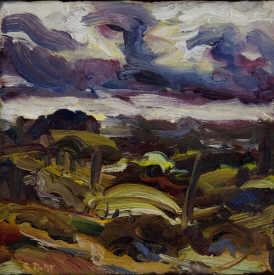 This exhibition sees her return to this loved subject with an old favourite medium, oil. 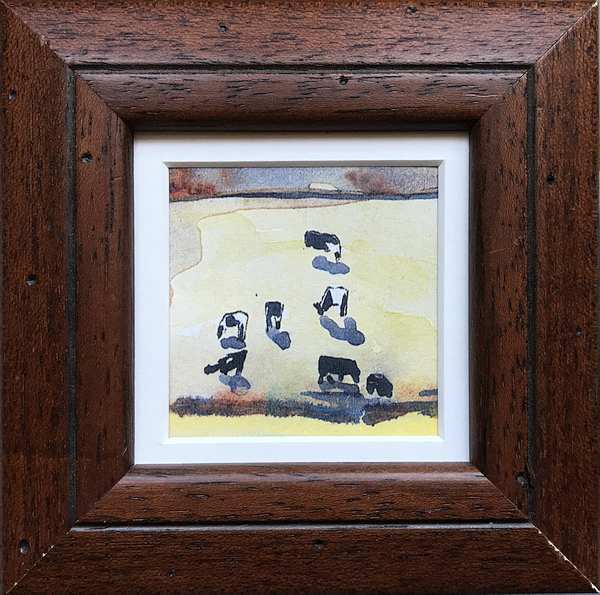 The small oils of flowers are contrasted by the large, bold acrylic paintings on canvas, showing the cows she sees on her current roamings - around the towpaths and bridleways of Bingley. 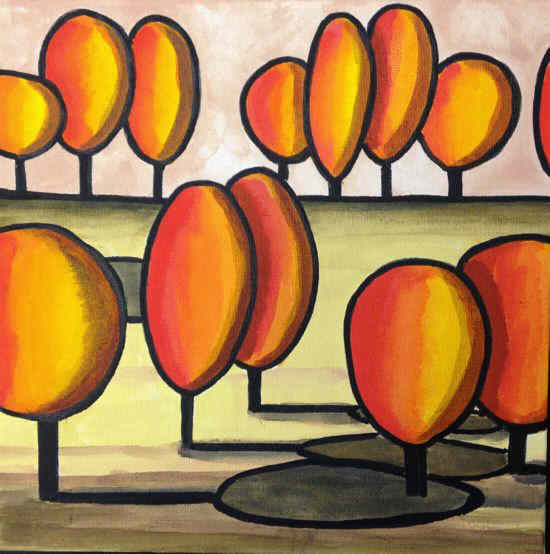 'More Brave Plants' 11½ x 30"
I've just heard that I had been selected as one of the Finalists in the Sunday Times Water Colour competition ! 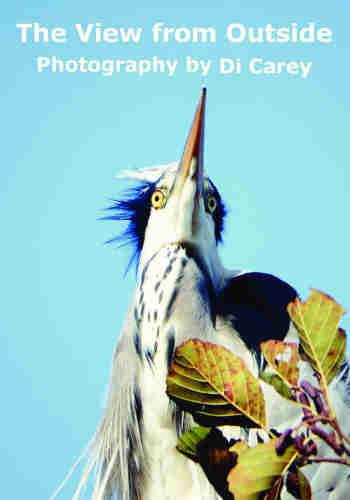 Monday 15th September - Saturday 20th September 10 am to 5 pm admission free. 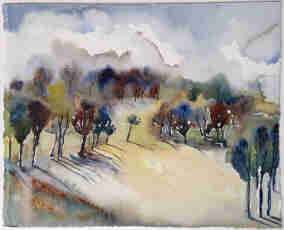 Jane has been selected to show two paintings, as a finalist in this prestigious nationwide competition. 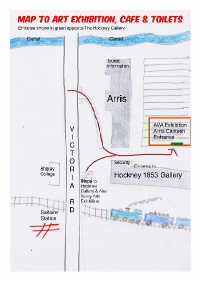 "Approximately 100 works will be exhibited at The Mall Galleries, London. 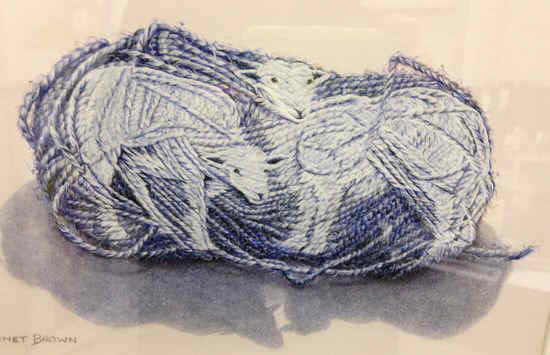 During the exhibition there will be a series of free workshops and demonstrations by past and current exhibitors." This is a new cafe bistro that has been launched by our good friends Mel and Pablo. Traditional breakfast, Greek and Mediterranean, Mexican, Tapas Bars and Tex-Mex. "If you are looking for a place to meet up with friends, have a bite to eat, try some of our exciting tapas and mezes or go a bit further and spice it up with our Mexican street food at the Lemon Tree Cafe & Bistro we have it all!" 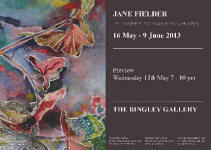 And featuring a show of Jane Fielder originals, with a Mediterranean theme. Do go along. Jane is delighted to have been recently reunited with her old school friend from Cheltenham and honoured to be exhibiting in her beautiful home in Saltaire. 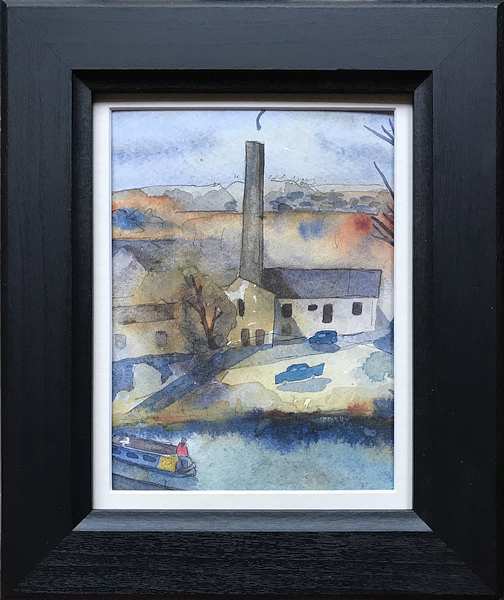 She will be showing her quirky Saltaire water colours alongside flower paintings, as well as prints, placemats, coasters and greetings cards of Saltaire. The garden has been created from scratch over five years and is now an abundant mixture of shrubs, perennials and potted annuals. 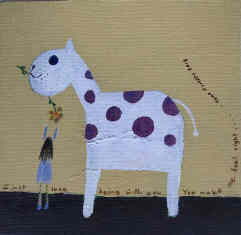 The gallery features Jane Fielder’s quirky works, plus cards created by Michael Grant from his original photos. In the garden, sculpture by Sam Shendl. Opening Date - Monday 23rd June. Closing Date - Monday 25th August. 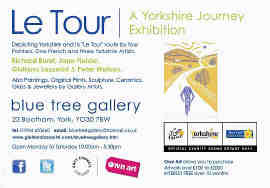 Celebrating that the "Tour de France" is holding stage 1 and stage 2 in Yorkshire this summer, with a stop over in York, Blue Tree Gallery is holding a special exhibition of selected artists, to feature Yorkshire, York and Le Tour, with the theme "Yorkshire Le Grand Depart". Jane is doing wheelies in excitement at being one of the selected artists, and plans to produce something special for the occasion. Romantic York 22¾ x 30 ins. Look at the promotional video "Welcome to Yorkshire" have done for the Grand Depart and also a link to "York City Council" which has a lot of information on the big event with more links and route maps etc for you. 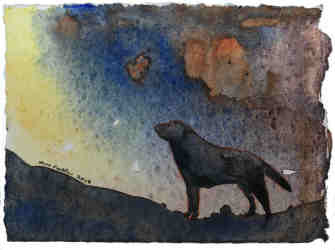 The Determined Dog, York 11½ x 60 ins. The Happy Cyclist, from “Minster Bells”, York 11¼ x 30 ins. The preview evening is Wednesday 30 July, from 7 to 9 pm. A show featuring several artists who have not shown with us before, and a few we have seen before. We are expecting a variety of styles and interpretations, unusual as well as familiar. The preview evening is Thursday 24 July, from 6 to 8 pm. This is a very special show put on by the pupils of Trinity All Saints School, Bingley. And it is marked with a special event on the first evening, Thurs 24th July, from 6 to 8 pm, where squash and buns will be served to everyone by the children.. The preview evening is Wednesday 2 July, from 7 to 9 pm. 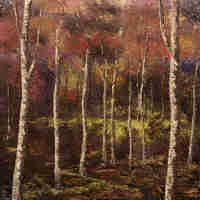 David is a Saltaire-based artist who produces heavily textured works with oil paint and palette knife. 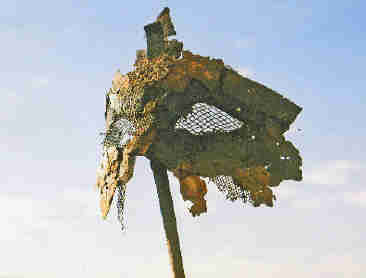 His subjects are mainly landscapes, often depicting native flora and historic and more ancient man-made features. Most recently he has turned his attention to trees. 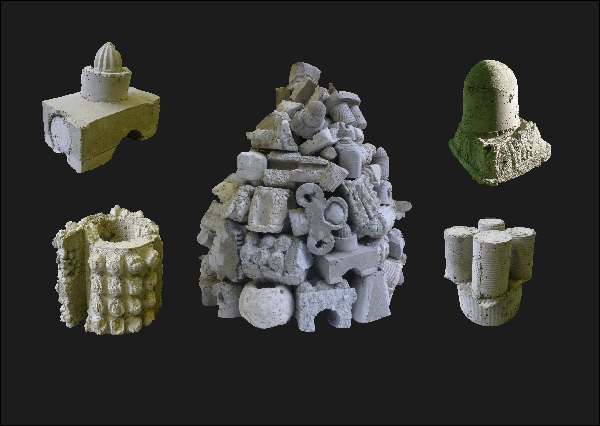 These may be familiar objects in our environment, but are too often taken for granted. By portraying the forms and character of individual specimens, or focusing in on the texture of bark and other elements, the viewer is led to a greater appreciation of these living structures. The preview evening was Wednesday 4 June, from 7 to 9 pm. A really good evening with lots of visitors. "... I like things to look like they look ..."
is Amy's self effacing comment about her work - and indeed they do! Amy Charlesworth's paintings are about more than this - her work has a filmic, noir quality about it, like looking at a still from an unwritten movie. 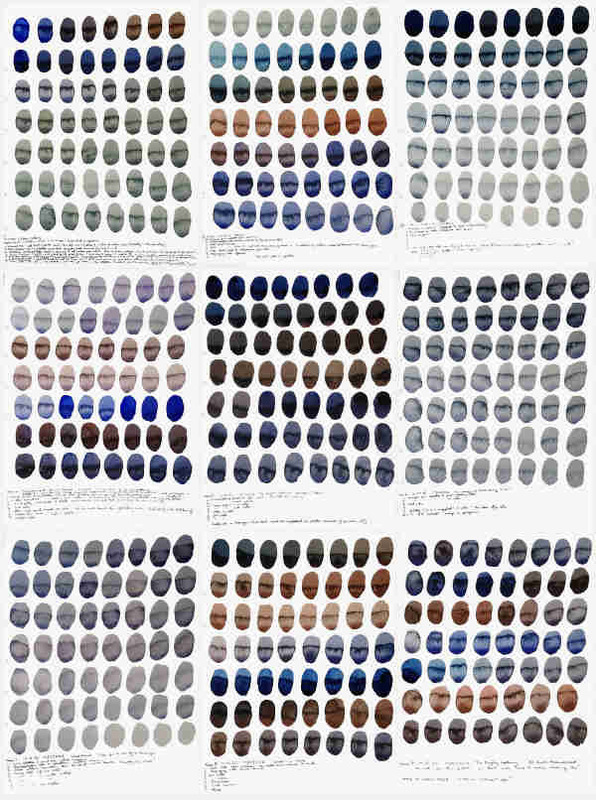 Through her use of lighting and shade and her rich, subtle colour palette she creates hyper-real representations of people and objects that have real depth and character. 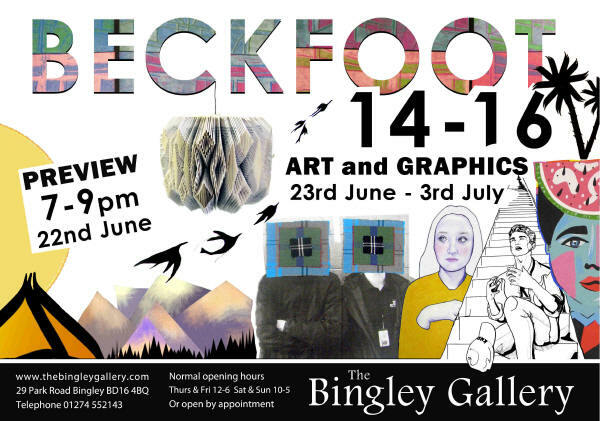 Sat 31st May 2014 to Thurs 12th June 2014, 10 - 4. 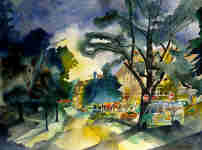 Jane will be showing a collection of her paintings of Harrogate, alongside her fellow artists from Aire Valley Arts. 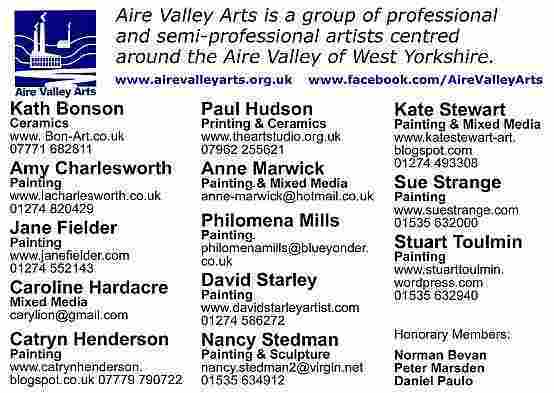 Aire Valley Arts is a group of professional and semi-professional artists centered around the Aire Valley of West Yorkshire, in the North of England,.who organise exhibitions and meet as a mutually supportive association. 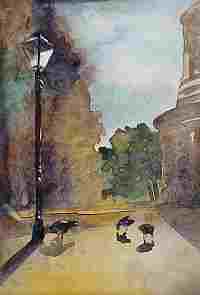 Harrogate 11½ x 8¼ ins. The preview evening is Wednesday 7 May, from 7 to 10 pm. 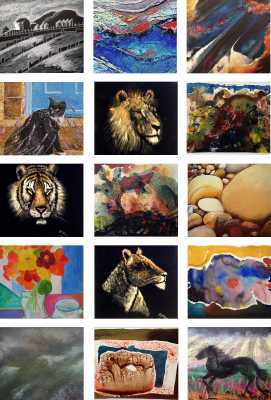 Exhuberant, vivacious paintings in soft pastel. "The raw material of the world becomes landscape only when we make a place the subject of our regard, impose a design upon it and allow memory and imagination to inform it. The beauty we see is shaped by our perception; it is our own creation. "I am fascinated by the hold that even very ordinary places can have over us and try, in my work, to understand and record how this comes about. The filmmaker James Benning defined an artist as 'someone who pays attention and reports back', and this is what I try to do." The Bingley Arts Centre is being reborn as a vibrant Community Centre, now under the management and direction of the Bingley Little Theatre team. They now have a place under their own control for presenting the ambitious stage productions, and have opened it up to many other local events and groups. One sign of this is the new series of art exhibitions in a specially created Gallery wall within the main lounge/cafe/bar area. This is an exciting chance for Jane to show her work, and she will be putting on a collection of her Janescape pictures, specially framed prints in an impressive range of heavy oak frames. All featuring views of Bingley and area. It can be viewed any Monday to Friday 11am - 3.30pm when the centre is open to take bookings. And of course, whenever the theatre is open for plays or any other event. 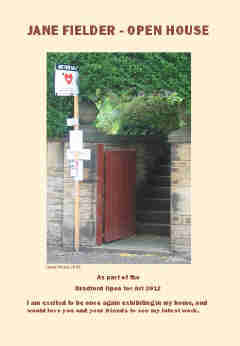 See www.bingleyartscentre.co.uk/whats-on.php for full details. see below. Closed between Mon 30th Dec and Fri 10th Jan.
A special collection for Christmas. Paintings. 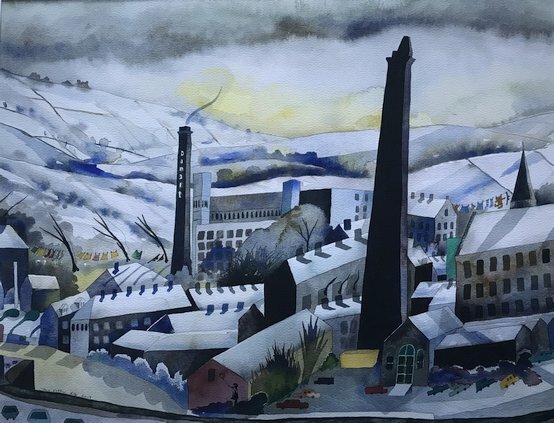 Jane Fielder presents a festive view of Staithes, and also new water colour and giclee pictures of Bingley with a seasonal feel, while Amy Charlesworth gets in the mood with snowy scenes and appealing robin redbreasts! Embroidered wall hangings by Kate Stewart. 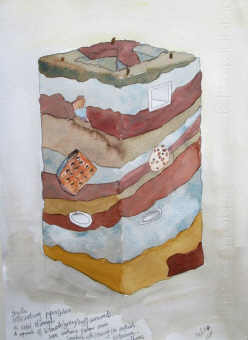 We've seen Kate's multilayered textile paintings, sculptures almost, before. This time we have flowing hung material, iridescent and atmospheric. Sculptures by Geoff Parker. Returning after showing last year, Geoff's spidery figures are sure to amuse. Unique Christmas gifts. Bingley themed Christmas cards, calendars, coasters, place mats, all taken from Jane Fielder's unique views of Bingley. But as always, there is a wealth of things to see everywhere else. 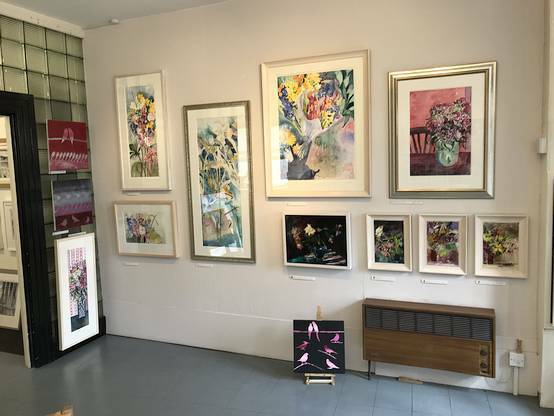 On the rest of the ground floor and in the basement there are more works by Jane Fielder, L. Amy Charlesworth, Norman Bevan and other selected artists. 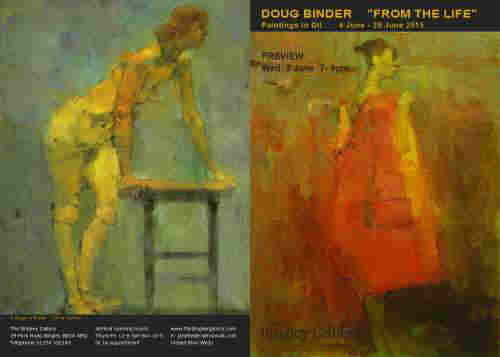 Two painters and long time friends exhibiting together for the first time. Both artists place the greater emphasis on paint handling and abstract qualities of surface. Working within the framework of a modern landscape tradition the two painters focus on the technical breakdown of paint and its effect on the scenes depicted. Daniel's current paintings are more grounded in a 'pure' linear abstract mode whilst Stephen's work conveys a sense of 'place' more conventionally. Norman's previous shows with us have been huge successes, his interpretations of Yorkshire and beyond are enduringly popular. Let us wish him the same success again. Exquisitely executed landscapes and townscapes, in acrylic. With an eye for architectural detail, and a precise technique, Norman brings a new, realistic but slightly surreal approach to his art. Life drawing and painting by Jane. The preview evening is Wednesday 18 September, from 7 to 10 pm. with the star of the show being the first canvas print of "Man With Dog, Bingley". 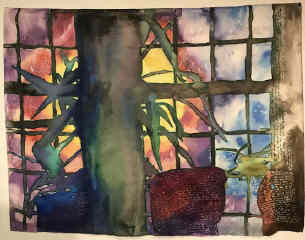 This is the largest painting that she has ever done, and takes the full width of the window. We are now entering the final week of the show. 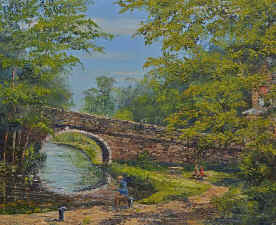 The star, this canvas print of "Man With Dog", Bingley has sold. Prints on water colour paper and canvas are still available to order. in Victoria Hall, Saltaire. 11-5 daily. Admission free. 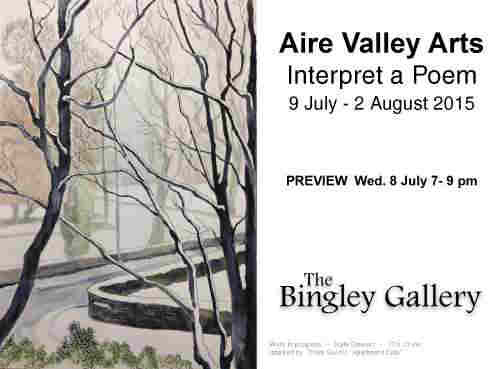 Aire Valley Arts is an association of artists. Jane Fielder has been a member since it started in 1995. The group meets to provide mutual support and inspiration, arrange exhibitions for members and to promote art in the area. 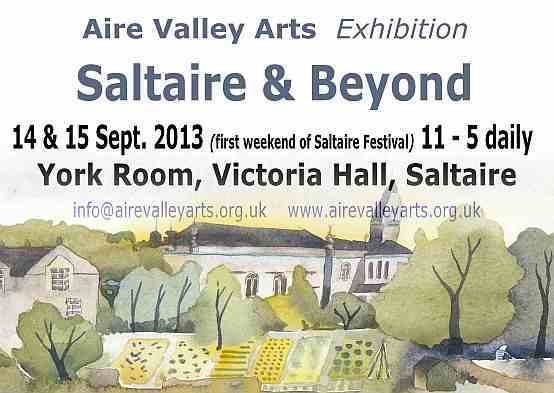 Aire Valley Arts will be hosting a dedicated display of their work in Victoria Hall as part of The Saltaire Festival. 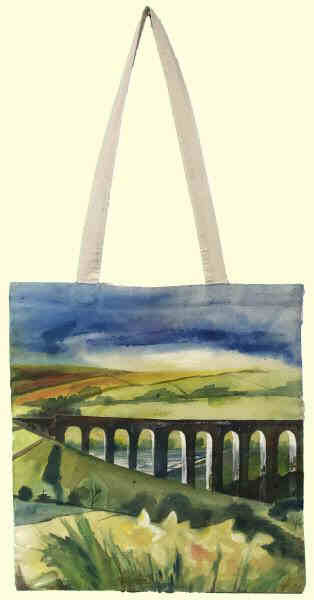 Jane will be showing a new collection of paintings, with a Saltaire theme, produced specially for this event. It will be a busy time at Saltaire. Events all over the village and a festive air. 14 - 22 September. 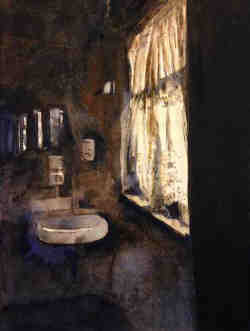 Jane is delighted to be showing again at Chantry House Gallery in Ripley. 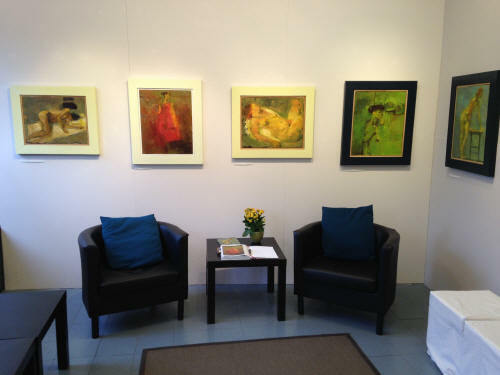 This is a beautiful little gallery in an idyllic village setting with a castle and quaint shops. Well worth a visit. Work by A Level students at Parkside School, Cullingworth features in the next exhibition, which runs from July 11 to 21st. 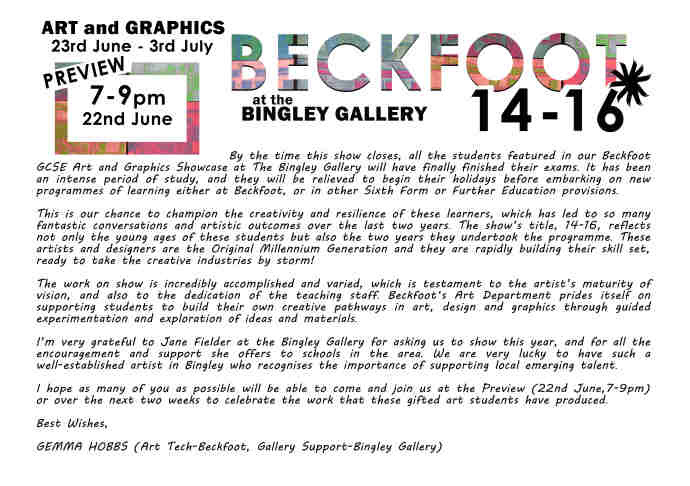 Plus a launch event on the evening of Friday July 12th from 7 - 9 pm, with a chance to meet the pupils/ artists. 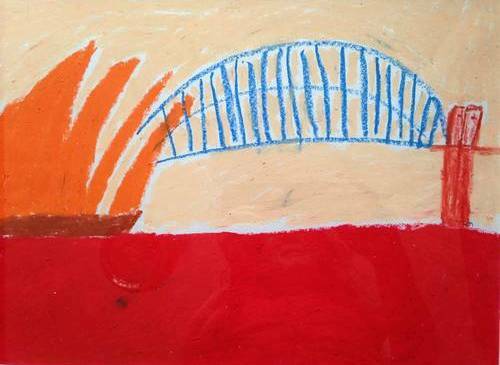 The budding young artists will see their work at our gallery, exploring themes important to teenagers like body image, self esteem and much more. The pieces were done throughout the students' final or penultimate year of studying photography and art. Launch Event on the evening of Friday July 12th from 7 - 9 pm. 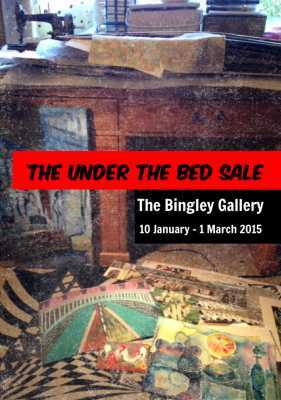 Currently studying fine art in Leeds, Chris is creating this show specifically for us at The Bingley Gallery. Certain to be challenging and unusual, and distinctly different from anything shown before, we look forward to seeing what his creativity will produce this time. 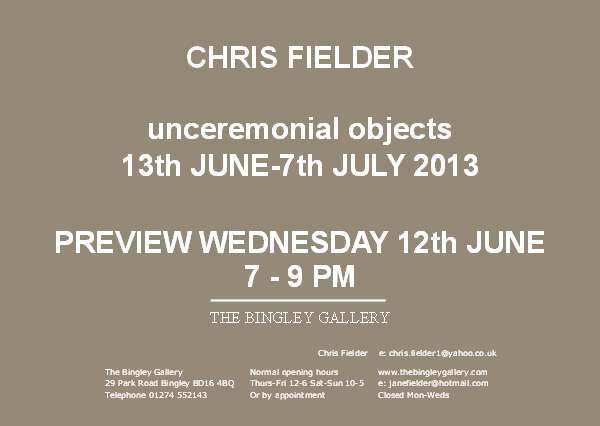 The preview is the evening of Wednesday 12 June, 7 to 9 pm, come and meet Chris and his friends. On Friday 28th June The Bingley Gallery will be hosting a talk evening around the themes of the current exhibition unceremonial objects. Chris will talk briefly about his work followed by an open discussion led by Rory Macbeth, artist and lecturer at Leeds Metropolitan University and Central St. Martin’s, London. The evening will also offer a unique opportunity to handle the exhibition’s wooden objects. Friday 28th June 2013 7 pm – 9 pm. Everybody welcome. 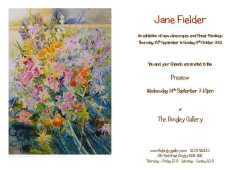 We would like to invite you to "Flowers to make you Happy" an exhibition of new flower paintings in watercolour by Jane Fielder. 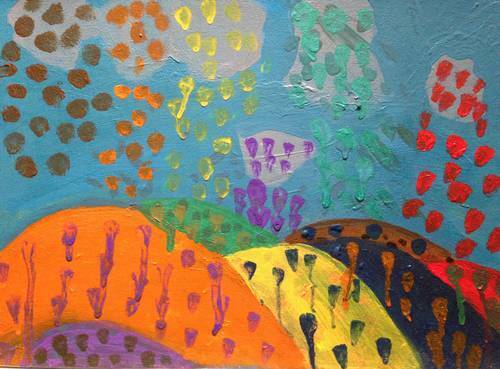 "They have been a great joy to paint. I have always been passionately interested in flowers. My childhood was spent observing the wild flowers of the Cotswolds. I roamed among boggy meadows of ragged robin, yellow flag, corncockles and cowslips, found early spring and spotted orchids on the hills, and once to my great delight found a bee orchid. I collect the flowers fresh from the garden, or buy a bunch, and with a mixture of close observation and simplification, I like to weave and shape them into aesthetically pleasing compositions. They are as much about life, love, colour, pattern, shape and paint itself as they are about the actual flowers." The preview is the evening of Wednesday 15 May, 7 to 10 pm, do join us to see the wonderful work and talk to Jane about it. 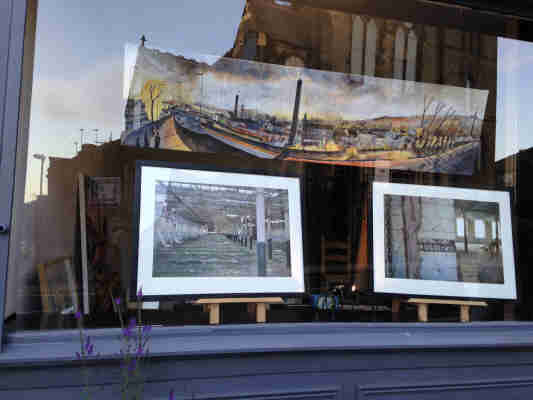 A long weekend of Art in Saltaire. 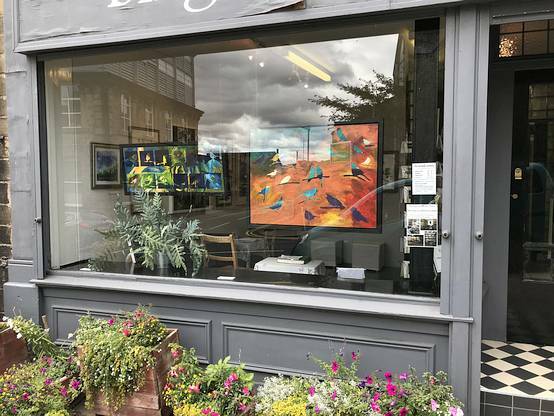 There is the now famous Trail of Open Houses where the householders are opening their doors to put on a display by artists from far and wide, but with a strong local regional bias, of high quality contemporary art and craft. Jane is showing at 35 Mary Street. Pick up a trail leaflet at shops, cafes, galleries, bars, and craft markes, libraries near to Saltaire, or download your own. As well as Open Houses there’s a Makers’ Fair, art and craft activities for all the family and tons of other things to do all weekend. See what's on. Marcus has a truly original style of art. He produces sculptures and paintings using nails! Thousands of them! Tens of thousands. 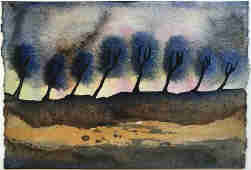 By varying the size, height, distance, he produces remarkable images of great subtlety. The preview is the evening of Wednesday 17 April, 7 to 10 pm, do join us to see the wonderful work and talk to the artist about it. 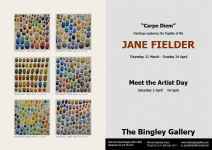 Celebrating the re-opening of The Bingley Gallery in our new premises, with a new collection of Jane Fielder's "Janescape" works. We had a special two day opening weekend event, Saturday 2nd and Sunday 3rd March, so thank you to all who came along to look and join us in our celebration. The Christmas show is now in full swing. 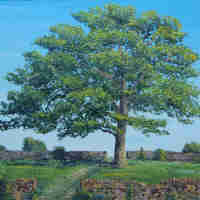 With lots of lovely paintings, prints, calendars and cards. We hope to get some more coasters in time for Christmas too. Wednesday - Saturday 11 a.m. to 5 p.m. Tomorrow, Sunday, is the last day of Tom Handbury's historic exhibition documenting the changing of Bingley Five Rise lock gates. 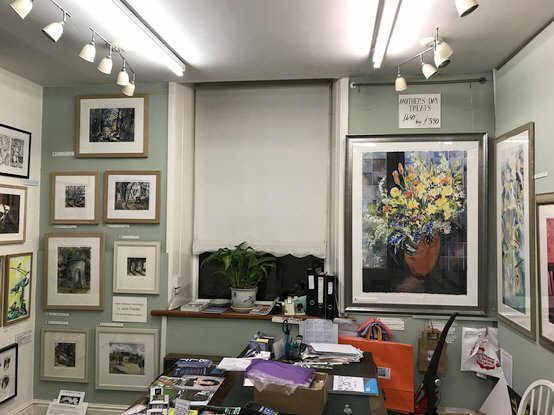 On Thursday 15th November for four weeks, Jane Fielder will be showing her recent Saltaire paintings plus her brother Ian Shearwood's quirky digital prints. A celebration and record in photographs of the monumental task of replacing the lock gates at Bingley Five Rise Locks. Tom was allowed privileged access to all areas of the site throughout the works and brings us an inside view of the process in stunning photographs. 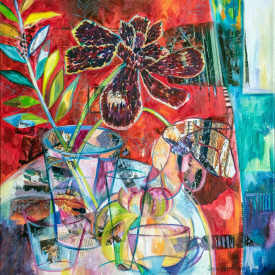 A changing collection of work from Jane Fielder and our other regular artists. 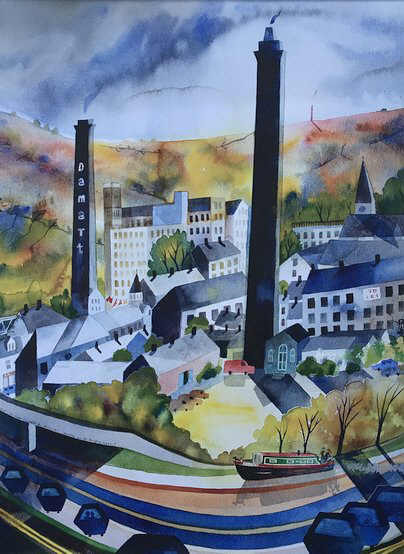 "Celebrating the beautiful village of Saltaire and its UNESCO World Heritage status. Over the 10 days, the village buzzes with life, energy and vibrancy and we want you to be part of it!" 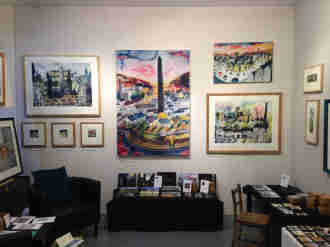 Amy Charlesworth - well known to regulars at The Bingley Gallery, original oil paintings on canvas. 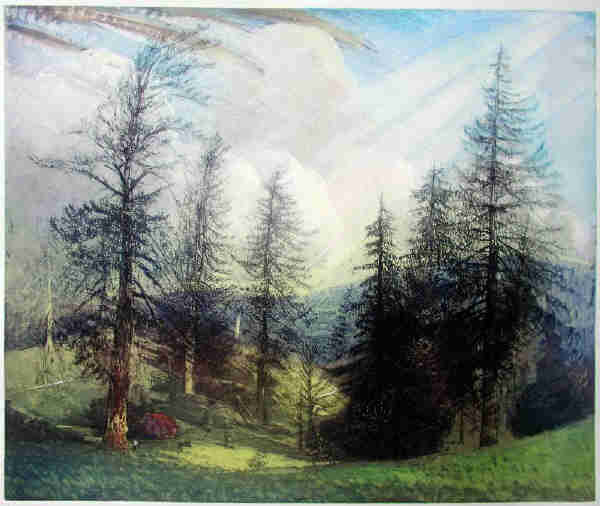 Peter Blagg - etchings and inkjets, and a curious take on the Bronte heritage. Lauren Marshall - another newcomer, opening her showing career. Featuring work by Mark Sofilas, Jane Fielder, Margaret Morris and Amy Charlesworth. This was a substantial show, with work in some six rooms across 2 floors. It was a charity event, fund raising for Saint Michael’s Hospice. There was a wine tasting, with canapés, in the pleasant setting of the Raworths Solicitors offices. With some very good wine, courtesy of Raworths. Last year's function was a very sociable occasion, thoroughly enjoyed by all. Saint Michael’s Hospice is a particularly worthwhile cause and has a very high profile in Harrogate. There is an entrance fee of £10 at the door, which goes entirely to Saint Michael’s Hospice. A proportion of all painting sales will also go to the charity. To help planning, Raworths would appreciate an RSVP if you are planning to come, though this is not essential. Just email Lisa on lisa.ross@raworths.co.uk, or ring 01423 566666. 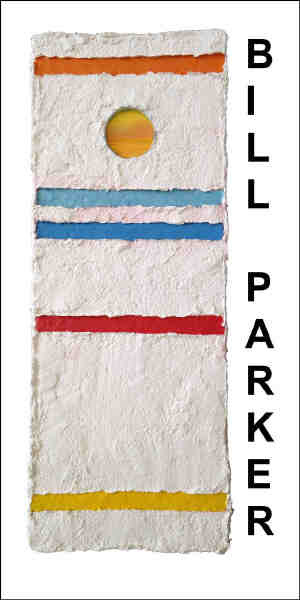 This their latest group exhibition, is simply taking the colour and allowing the artists to respond to it. Some samples on the invitation. After that we will be as surprised as you. I shall be showing 4 pictures in the Main gallery. 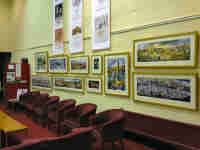 As well as the Main Gallery event in the Civic Hall, there are fringe events throughout the town and wider area. A thoroughly good day out! 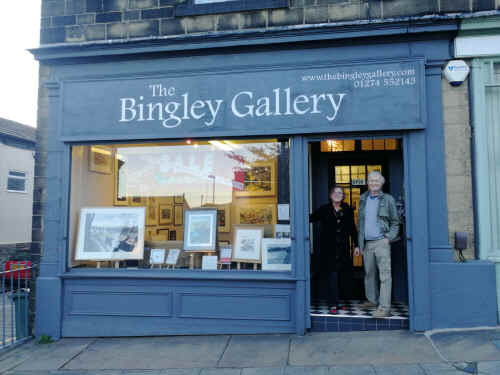 Their latest exhibition, at The Bingley Gallery, provides the opportunity to showcase the diverse talents of the group with a variety of subjects, as well as their common bond of Yorkshire paintings. Variety is apparent also within the media employed and the approaches that illustrate that these artists are moving on, pushing boundaries. 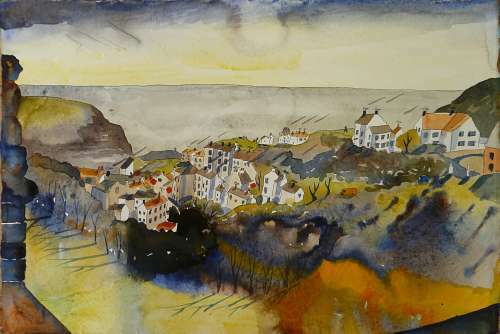 A new collection of work by Jane, inspired by the Yorkshire fishing resort of Staithes. 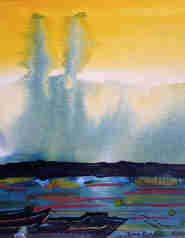 Exploring her fascination with the colours, views, perspectives, and contrasts offered. There will be some 60 venues Open for Art, and as part of this extravaganza, I shall be opening my house (which is also my studio). Do come and have a look. 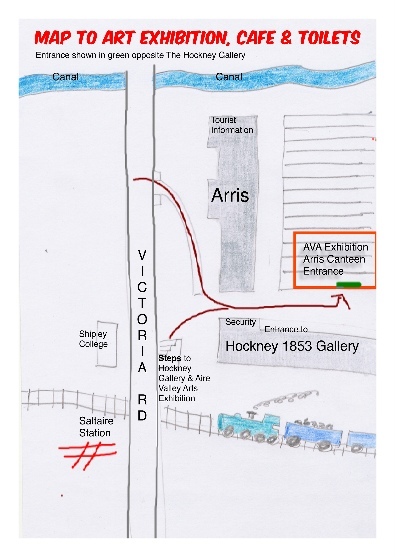 Saturday 2nd – Tuesday 5th June 2012, 2pm to 7 pm. Cuppa and cake on the lawn, pictures throughout the house. Look in the invitation (link on right) for sample pictures and a map. 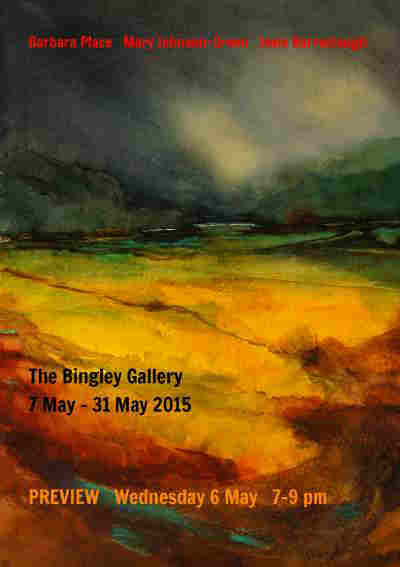 The Bingley Gallery will also be open for the whole four days 10 am to 5 pm. -plus of course, the added attractions of the galleries and museums of the area!" 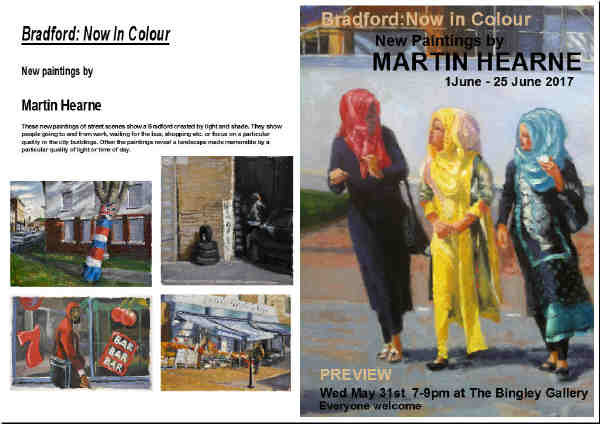 See Bradford Open for Art website for more. Special extra opening days and times at the gallery for the long weekend. We will be open Monday to Thursday, from 10 am to 5 pm each day. And alongside that, there will be Open Days at my home and studio 2pm to 7pm, see below for more details. 9am - 5pm 7 days a week. Please phone to confirm before making a special journey. SPECIAL EVENT - for details see right. "Windows through Windows through a broken Window"
These photographs were taken in 1998. 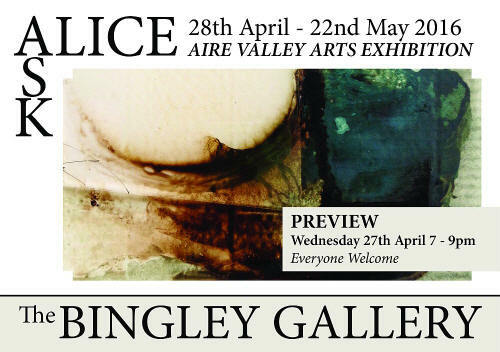 Aire Valley Arts had been offered an exhibition to be shown in the mill before its renovation. A wonderful morning was spent exploring the place with camera in hand. The vastness, decay and sunlight were so inspiring and exciting – yet so sad. Like much of my work I concentrated on little flashes of colour or details that amused me or stirred something within, hinting at the life and activity now long ceased. The Manningham Mill has since been renovated, with apartments and a Community Association, and the opportunity has arisen for me to display these pictures in the same building they were taken in. So I am delighted to announce the show is now on. I'm showing about ten of poster size photos of the derelict mill, some never exhibited before, together with some of my more familiar water colour and landscape work. Meet the artist, with tea and cake. 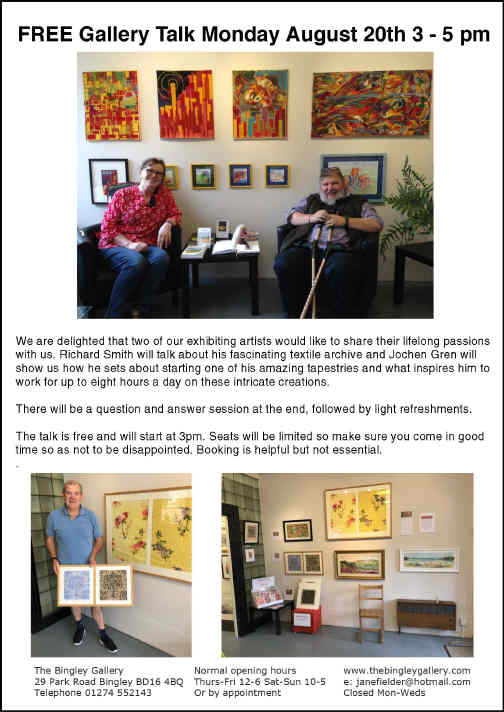 Do come along to see the show, have a chat, with free refreshments. We are delighted to present Ben's first Solo Exhibition. "Ben Snowden’s work explores the boundaries between figuration and abstraction creating works that are profoundly emotional and utterly subjective to the interpretation of the viewer’s personal mood. His work is recognizable by the almost unformed nature of his figures and landscapes, through a use of deliberate characterization and colour, he evokes a deep sense of ambiguity that challenges both the literal and abstract within the outside world." Jane Fielder, Amy Charlesworth, Gemma Hobbs, Evelyn Friend, Joanne Bocskei, Paul Hudson, Melvyn Crann, the late Roland Smith and Neil Palliser, Norman Bevan, Jonathan Ashworth, Rachael Shearwood, David Greenwood, Diana Blagg. A special collection for Christmas. 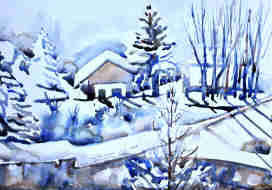 Paintings, unique Christmas gifts, cards and calendars. From a wide range of artists. Norman's last two shows with us have been huge successes, near enough total sell-outs.. Let us wish him the same success again. 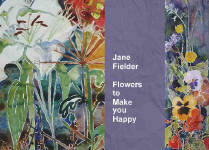 A new collection of Jane Fielder's work. 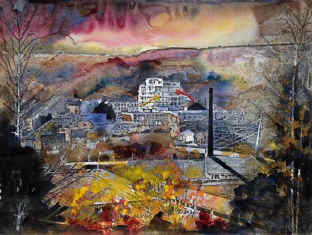 Quirky urban landscapes - Janescapes - together with her exuberant flower paintings. Update December 2011. 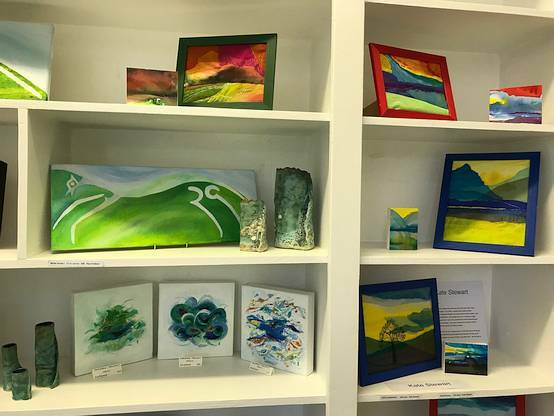 Although the special charity wine tasting evening has now taken place, many of the paintings are still on display at Raworths, and can be seen by arrangement with Raworths. 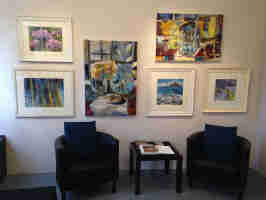 Paintings by Jane Fielder and Amy Charlesworth. 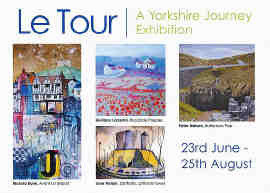 There will be a substantial show, about 50 pictures each, including some specially painted of the Harrogate region. Also featuring a new big Jane Fielder Janescape of Bingley in the winter, see right, happy people playing in the snow, and 'Cold Cows'. This is a charity event, fund raising for Yorkshire Cancer Research. 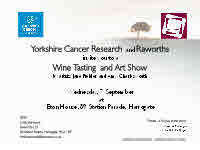 There will be a wine tasting, with canapés, in the pleasant setting of the Raworths Solicitors offices. You are promised some very good wine, and Jane and Amy's paintings will be on display throughout, and available to purchase. There is an entrance fee of £10 at the door, which goes entirely to Yorkshire Cancer Research. A proportion of all painting sales will also go to the charity. To help planning, Raworths would appreciate an RSVP if you are planning to come, though this is not essential. Just email linda on linda.harwood@raworths.co.uk. 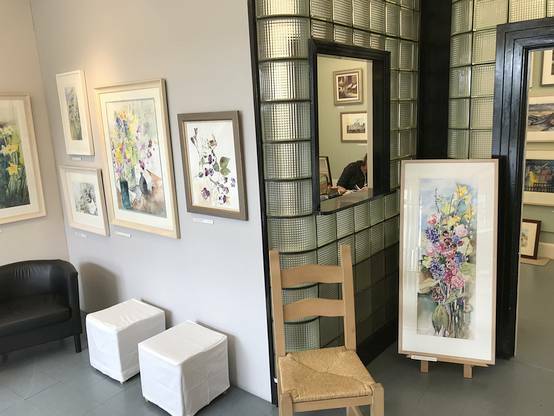 We are delighted to have two new collections by much loved artists David Greenwood and Judith Levin, plus work from Jane Fielder and the other gallery artists. "My work has been collected internationally for over 20 years but lately I have come home to study the local landscape only. 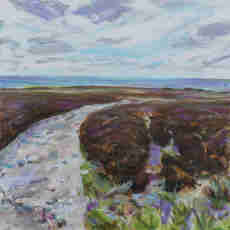 This is a collection of paintings inspired by vast areas of moorland. They are contemplative paintings, oil on canvas, in response to the changing mood and weather over the natural land, its abundance of heather, occasional springs and brooks, distant haze and the untravelled path." Tuesday - Sunday 11 am - 4 pm. It is an honour to have been asked to return with a second Solo Exhibition at this prestigious venue. Preview Sunday 17th July 12 noon to 2 pm. Continuing Tuesday - Sunday 11 am - 4 pm. The Bradford Open is an unrivalled showcase for the district’s artistic talent. Works on show have been selected from artists and craftspeople who live or work in the Bradford District. This is an opportunity to support local creativity and to snap up a bargain by the next David Hockney. Jane submitted three of her Janescape paintings, and is thrilled that all were accepted and are now on display in Cartwright Hall. The two larger ones have pride of place on entry to the main hall, and the third in the other hall. Jane was thrilled to have shown at Duncan Campbell Fine Art in Kensington, London in 2009. She will be returning at a later date with 'a winter collection'. It is with great sadness that I have heard that Duncan passed away in February 2011. He was very kind to me and generously introduced my work to his clientele. I always found him very warm and friendly, and hugely knowledgeable about art and the art world. I will miss him. Work in 2 and 3 dimensions from a creative life spanning 6 decades will be gathered for the first time in this exciting exhibition. Kath and Philomena grew up in Keighley together. They attended the same schools and in the early 80's they both went to Art College. Inevitably they eventually went their separate ways but they both still live and paint in Keighley. This is their first joint exhibition and it is an interesting mix of contrasting styles and approaches to their local environment. Exploring the fragility of life, and particularly of the effects of mental disturbance on its victims and their families. Jane will be showing a new series of paintings which respond to her own personal experience of her mother's stroke and mental health/anxiety issues in a broader sense. At the same time as Jane made her paintings, unknown to her, her brother, Ian Shearwood put together a Pecha Kucha performance (20 images x 20 seconds) entitled "Mother". It was part of his response to the same family crisis. 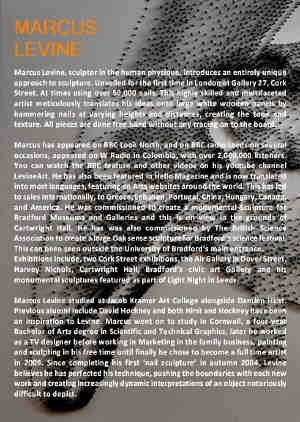 We will be showing an audio visual recording of his piece at this special evening event. Amy, first prize winner of the Bradford Artists Open 2010, and well known to all regulars at The Bingley Gallery, will be displaying another collection. 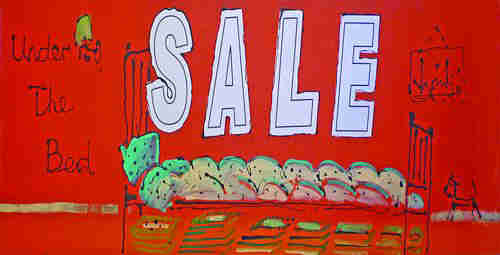 Time for our artists' annual “spring” clear-out, lots of bargains. Things that haven’t fitted into other shows, unusual pieces, work that hasn't had a chance to be seen before. Including paintings, textiles and sculptures from £5. 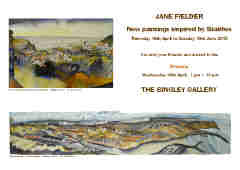 Artists exhibiting:- Jane Fielder. Chris Fielder. Thank you Cupola Gallery for the brilliant idea and perfect name for this show. A hundred cats, in paintings of all shapes and sizes, arrayed floor to ceiling. Plus beautiful needle felted brooches by Maria. Two artists showing alongside each other. 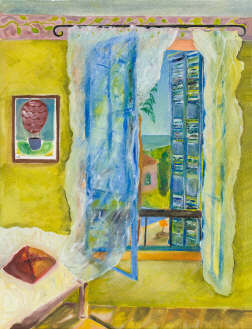 Both observe and record objects and scenes in their individual and very different ways. David Thomas's paintings are the record of a process of intense and active observation coupled to an emotional response to the physicality of paint. His interest in painting still-life goes back over 20 years to an original concern with describing architectural and sculptural spaces. He pays attention. Nancy - "I combine my fascination with the process of drawing with exploring our physical experience of being in the landscape - through a walk along a canal or a night time view. Recent pieces explore ways of capturing glimpses of distinctive landscapes in simple sculptural forms." 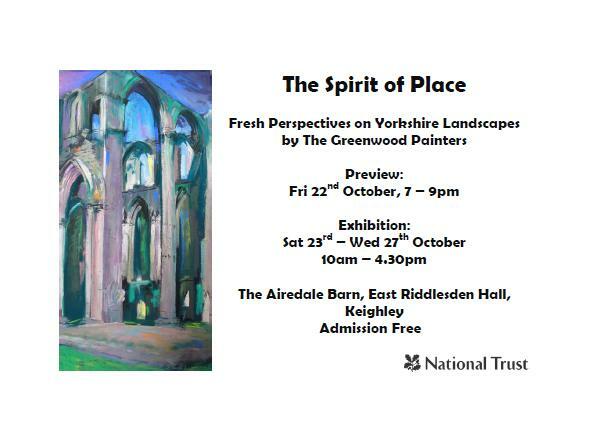 Local artists, The Greenwood Painters, which include Jane Fielder, will be showcasing new works at East Riddlesden Hall, Keighley in the Airedale Barn. The exhibition runs from Saturday 23rd October to Wednesday 27th October, 10.00am – 4.30pm. Admission is free. Following on from the success of the exhibition last year to celebrate the Hall’s 75 years as a National Trust property, the Trust has invited the group back to exhibit this year. 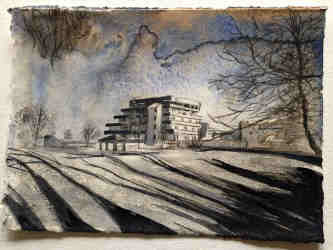 David Greenwood, Artist in Residence, has held workshops again at the Hall and at other Trust properties in Yorkshire. 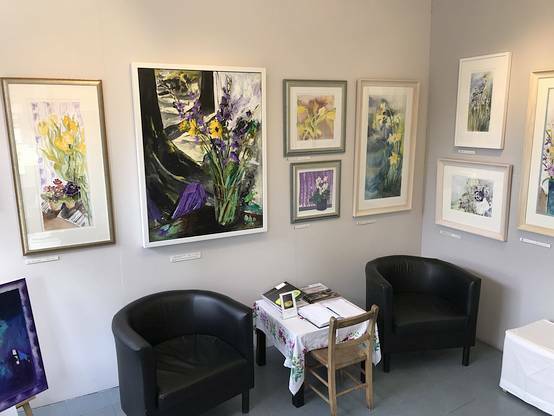 The exhibiting artists last year remained as a group and have been drawing and pastel painting at a variety of locations in all weathers throughout the year. They have been joined this summer by new members attending the second year of workshops. “Working in a group has been very motivating, both to travel to new locations and to keep the momentum going throughout the year. We encourage each other and learn from the variety of work produced. It is very gratifying to be invited back to exhibit at the Hall. The staff at East Riddlesden Hall have been most supportive”, said Susan Duffey, group member. In her first exhibition with us, Rachael brings her youthful eye to showing life and relationships, emotions, which are explored through the medium of printmaking. She will be showing in the upstairs gallery space, and the show runs in parallel with Jane Fielder's show in the main gallery. Show extended. Continues in the Upstairs Area. 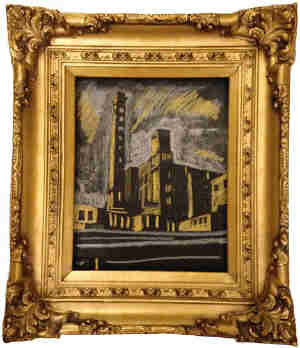 A new collection of Jane's unique style of urban landscape. Quirky, colourful, and exploring her home town Bingley. Other paintings in the show visit Berwick on Tweed, Holmfirth, Ilkley, Haworth, Bradford, Norfolk, Hewenden and a couple from Playa el Salon. And from Thursday 7th October, we shall have limited edition Giclee prints of a selection of the new Original watercolours from this show. It truly is an honour to have been invited to show at this exhibition, Set in the splendour of Ripon Cathedral, selected artists are showing their work. A percentage of any sales will go towards maintaining the music and choral traditions of the Ripon Cathedral. I shall have six paintings on show. Open daily 10 am to 4:30 pm, admission is free, all welcome. 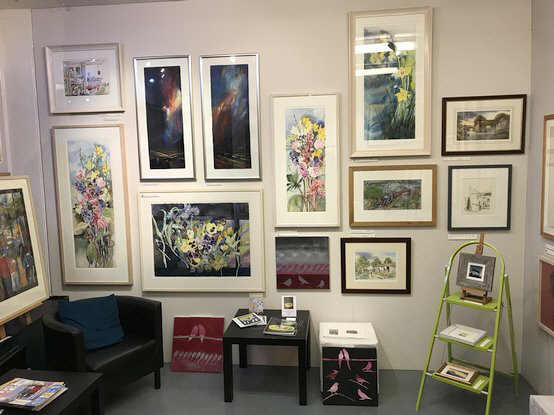 In this one week intermission between shows, The Bingley Gallery will still be open as usual, with a selection of Jane's framed prints in the downstairs area, and a collection of work by Jane and other artists upstairs. "A show about moorland; peace, solitude and conservation of the land." 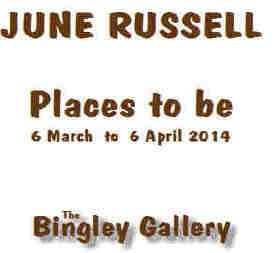 " I am absolutely delighted to be doing this show at the Bingley Gallery. My work has been collected internationally for over 20 years but lately I have come home to study the local landscape only. 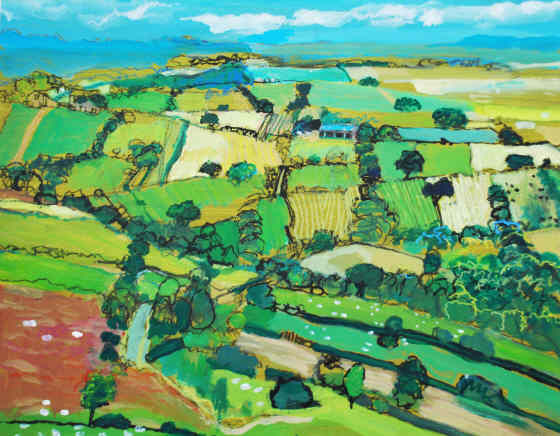 This exhibition is a collection of recent paintings inspired by vast areas of moorland. They are contemplative paintings, oil on canvas, in response to the changing mood and weather over the natural land, its abundance of heather, occasional springs and brooks, distant haze and the untravelled path. 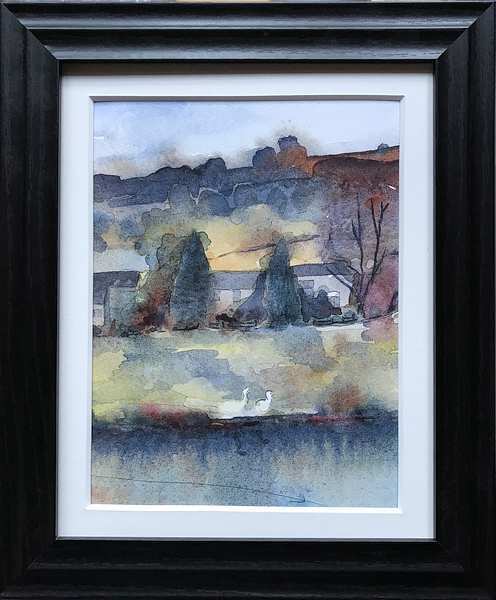 In the studio my professional interest is in light and texture but on a more emotional and personal level it is just about the inexhaustible beauty of the open spaces here around us in Yorkshire. " 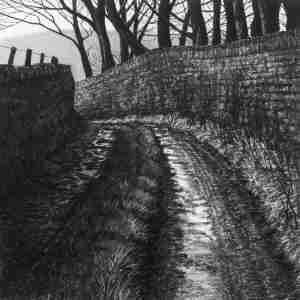 "I am a painter and fine art printmaker based in Bradford. I love cities, particularly the one that is my home, and I take them as a starting point for my work, which explores the role that landscapes play in the lives of those who live in them." Every time I see a tulip fully open or a brave snowdrop pushing its way through black soil I feel compelled to speak about it. This is a collection of flower paintings about my thoughts. They are painted mainly in water colour but other media tend to creep in - they very often start in a representational way and become more abstract as I lose myself amidst their splendour. 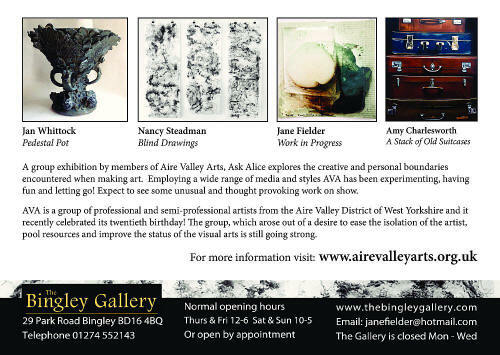 Three members of the Aire Valley Arts group, working in very different media, and different styles. Kate Stewart's textile work uses transparent fabrics like watercolour washes, creating delicate and three dimensional effect. Caroline takes found material, wool, torn paper, ... to make eye catching results. Karen brings a background in illustration, graphics, website and multimedia design, but will I am sure surprise us all with this show. "Bruce Rimell is a visual and graphics artist working with a variety of mythological, psychedelic, visionary, narrative and petroglyphic themes based in the city of Bradford, West Yorkshire in the UK. He works in a range of media from inks and markers on card through acrylics on canvas as well as digital vector art printed on textiles. 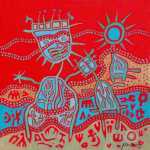 His work is just as often described as Aboriginal or tribal in style as it is described as reminiscent of Keith Haring and graffiti art, and he aims to bridge the gaps - stylistic, cultural and spiritual - between the very ancient and the very modern. " 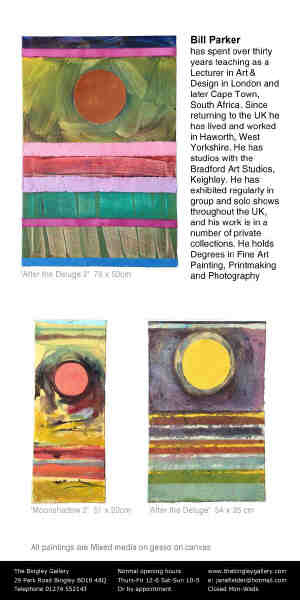 On the very night of the opening of the show here at The Bingley Gallery, Bruce was delighted to find that he had been chosen winner of the ArtsMix first prize in the Emerging Artists Awards 2010, in the Fine Art Practitioner category. More about the award ceremony here. 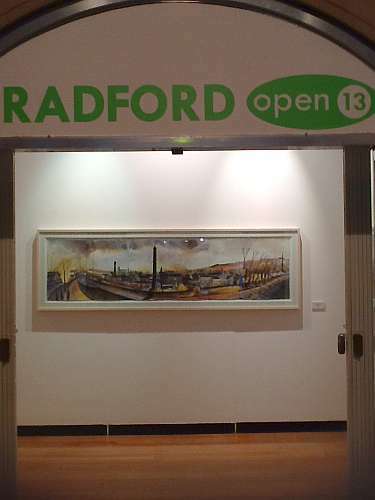 The Bradford Open is an unrivalled showcase for the district's artistic talent. Any artist and craftsperson in the Bradford district can submit to a selection panel, who also award prizes to the very best. Jane has submitted 2 pieces, and both are accepted. She has a typically quirky view of Bingley in "Kiss, Co-op, Copydex …Cars, Cars, Cars", and a rather more unusual stitched textile (mainly) wall hanging "Granny will be 100" produced by her and her extended family during visits to Granny. Talent runs in the family! And don't forget, out very own Amy Charlesworth is the overall WINNER of the Bradford Open, gaining first prize for her entry! 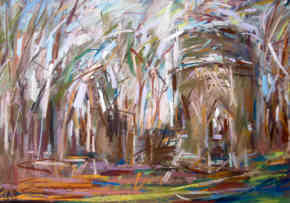 David brings a new collection of his amazing and energetic pastel paintings to The Bingley Gallery. Abbeys, canals, longboats, people and even a Spitfire. 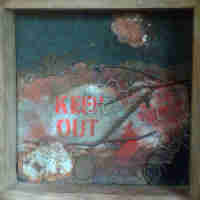 We are all very pleased for Amy being the First Prize winner in the Bradford Artists Open 2009. 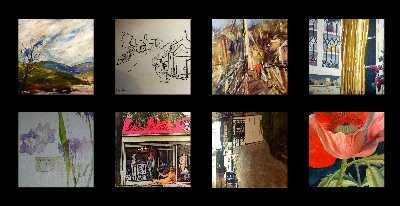 A mixed exhibition by the three resident artists of the gallery. New work from everyone. 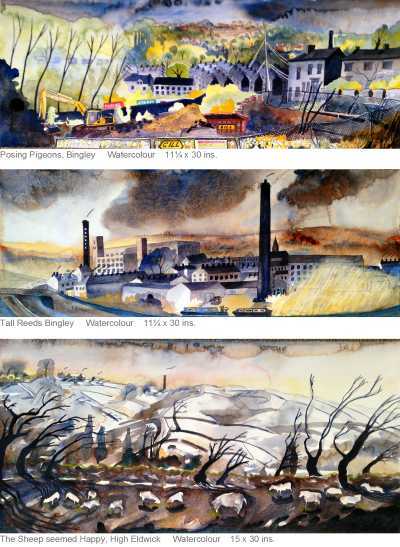 ‘Bingley Secrets’ is Christopher Dunn’s first exhibition of his watercolour paintings. 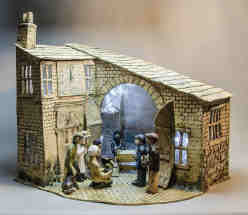 Completed during the time he spent living in Bingley, they are the product of his imaginations while walking the streets and waterways of the town. Real life characters born in the area such as the boxer Percy Vear and cosmologist Sir Fred Hoyle inspire some pieces while others are pure fantasy. All have an accompanying poem also written by Christopher that adds an extra element to the exhibition. Neil Palliser loved people, he delighted in their company and was fascinated by their physical form as they moved through their daily lives. 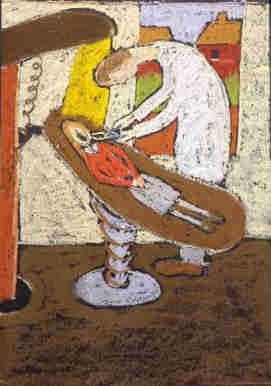 This exhibition also reveals the range of his working methods. 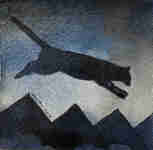 Watercolour, pastel, pen, pencil, oil, charcoal, lino print...... he was equally comfortable with them all. Neil Palliser was a well loved resident of Bingley and founder member and chairperson of Aire Valley Arts. He exhibited widely in this country and internationally and was the winner of many National Arts Awards. Neil died in 2005. 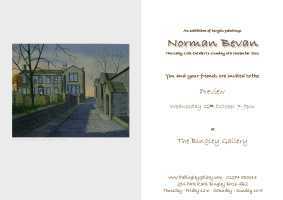 "United Reformed Church - Saltaire"
Norman's show with us last year was a fantastic success, with EVERY picture selling. Let us wish him the same success again. 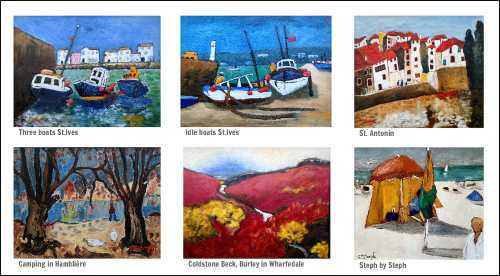 A new collection of Jane's 'Janescape' paintings, most not before seen at the gallery. 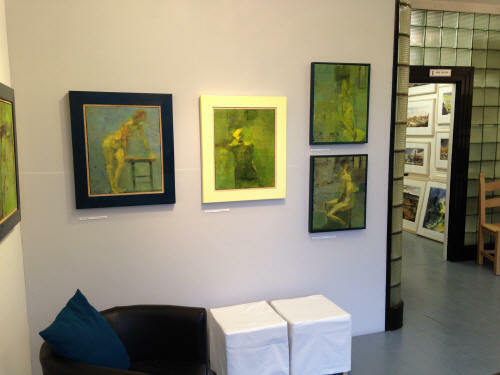 and alongside Chris, we have two large scale oils on canvas by the much sought after Judith Levin. 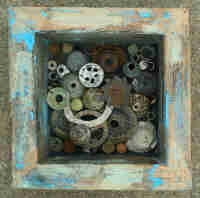 Jane has been selected as an exhibitor at the Artist Open now on at Leeds Art Gallery until 1 Sept. 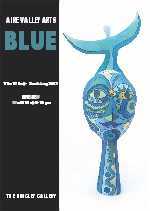 This is an annual event, and the work is a diverse selection of innovative painting and sculpture chosen from Yorkshire based artists. and alongside Gemma, we have two large scale oils on canvas by the much sought after Judith Levin. Daniel, a prize winner at the recent Saltaire Open, studied art at Bradford and Ilkley College, and the University of Huddersfield. 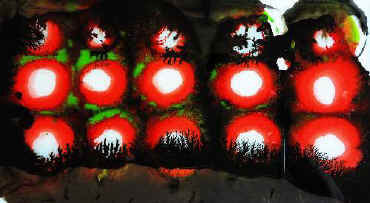 He has shown at several Group Exhibitions. 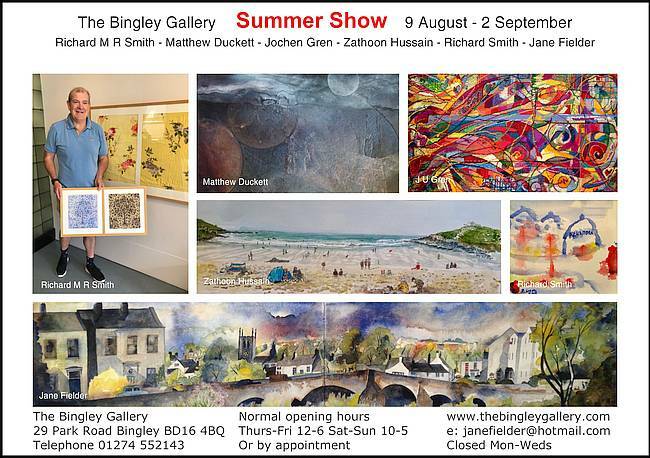 He is having his first Solo with us at The Bingley Gallery. We wish him every success now and in the future. 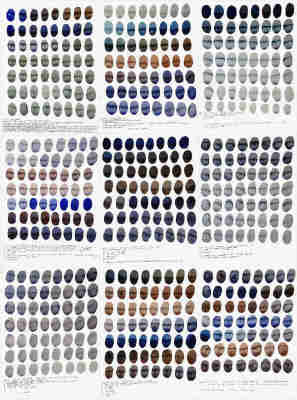 Daniel and Jane are also both exhibitors at the Artist Open Show 2009 currently on at Leeds Art Gallery until 1 Sept. 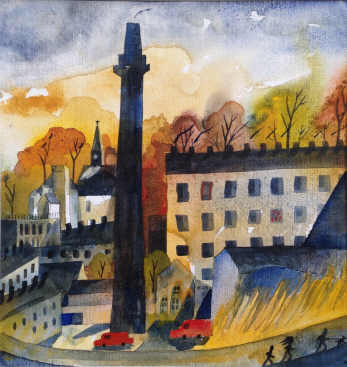 Showing alongside Daniel, we have a water colour of Saltaire United Reform Church, by Christopher Dunn, another emerging artist. 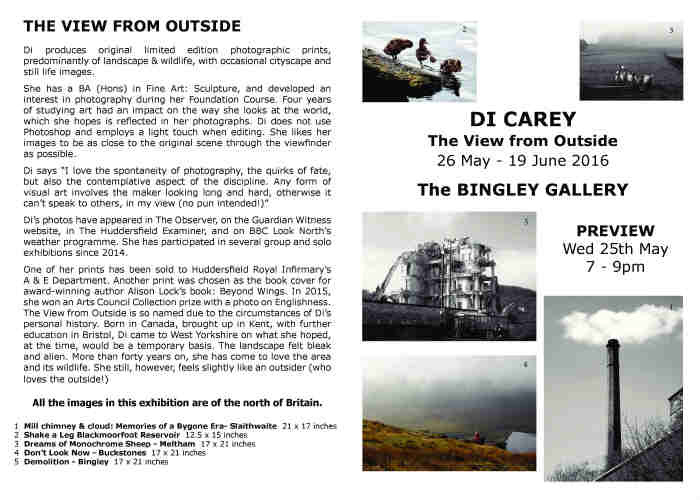 We are looking forward to some of Chris' quirkier views of Bingley later this month. I shall be showing 4 pictures in the Main gallery, large scale photos taken in Manningham Mills, Bradford, in its derelict state before renovation as apartments. As well as the main event in the Civic Hall, there are fringe events throughout the town and wider area. A thoroughly good day out! My 2008 exhibition at Duncan Campbell Fine Art in Kensington, London was really successful. I was thrilled to have been invited to show, and even more thrilled that the Janescapes style went down well in the capital, and that I have been invited back this year. This time, as well as the Janescapes, I will be showing my life drawings and flower paintings. 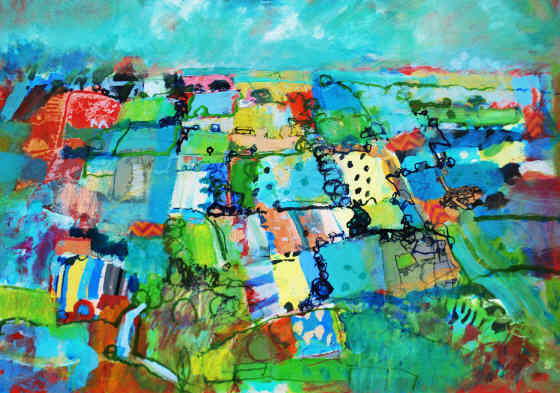 Sue Strange is a painter inspired by landscape to create semi-abstract paintings in a rich and colourful style. Rhythms in the landscape provided by natural form and built structures provide a framework for experimentation and expression in intense colour and texture. Ann Marwick - "I find abstraction is what interests me - removing all that is peripheral from the ideas that come from within." A long standing annual exhibition of Yorkshire regional artists, this year again set in the 'The Light', a major shopping mall in the centre of Leeds. It is a showcase for established and up and coming talent in and around the Leeds area. The work is for sale and the communal setting makes it easily available to a wide audience. I'm planning to be showing about 20 pieces. 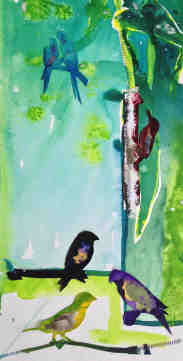 Jane will be showing a collection of work from her varied styles. It will include the Red Bucket series of photographs taken at Lister/Manningham Mill when it was still derelict and before the Urban Splash redevelopment. Alec derives his inspiration from a continuing fascination with aspects of archaeology especially those concerning the use by early cultures of various signs and symbols, and the simple graphic forms of figures and animals. And in the upstairs area, we have work by Jane Fielder, Chris Fielder, Ian Shearwood, Chris Dunn. 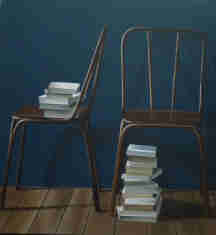 We also have 3 by James H~ardaker in store, for those who are interested in these. 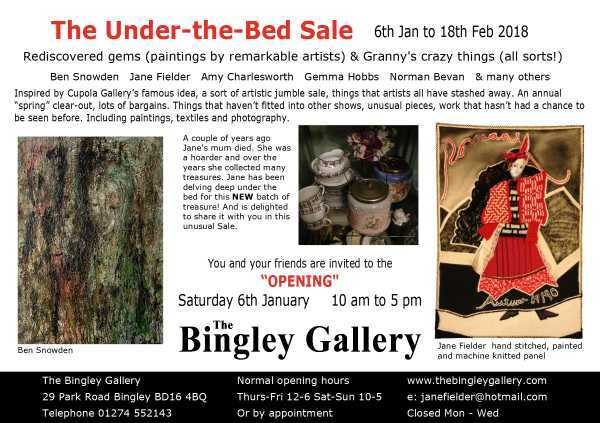 from Saturday 10th January 2009 and EXTENDED AN EXTRA WEEK to Sunday 1st March The Bingley Gallery "Under-the-Bed Sale 2009"
We also have on sale the last 3 James H~ardaker pictures from our exhibition of his work last year, and several digitally creative interpretations of Bingley from Ian Shearwood's earlier show. 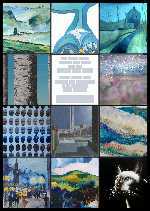 A mixed show, with seven artists showing. We have Jane Fielder, Amy Charlesworth, Gemma Hobbs, David Greenwood, Andrea Ellis, Daniel Paulo and Ann Cruickshanks. 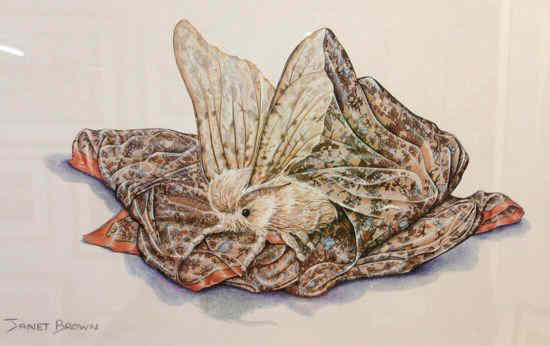 Jane will be displaying some delicate silk paintings, a collection of unique hand painted silk ties, and some handmade cards for Christmas. And of course her more familiar styles. Together with the varied approaches of the other 6, we have an exciting mixture of techniques, colour and inspiration. Thursday 2nd October – Sunday 26th October 2008 Daniel Paulo and Ann Cruickshanks "Strange Angels : Tiled Skies"
He is joined by Ann whose work celebrates nature with vibrant textural landscape and flower paintings with richness of colour and attention to detail. 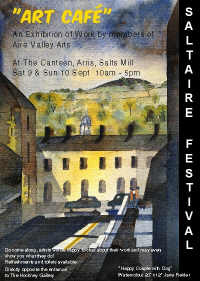 Thurs 4th September – Sunday 28th September 2008 Aire Valley Arts "Shared Shapes"
“Aire Valley Arts” is an association of local professional artists. 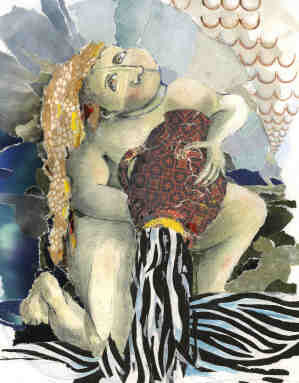 Normally diverse in their styles and approach to art, they are linked this time by choice of format. All are working on tall thin canvases in one of 3 sizes. All work is specially produced for this show. Thursday 6th August - Sunday 31st August 2008 Jane Fielder "New Janescapes"
This is Jane's long awaited new collection of Janescapes. 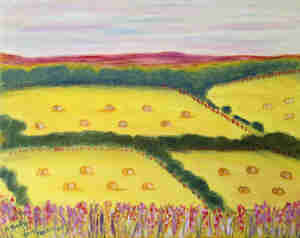 They are in Jane's unique style capturing the impressions of a landscape, but in her special quirky, humorous and colourful way. New pictures of the local Bingley area and further afield. 10th July - 3rd August 2008 Ian Shearwood "Gradely Bingley"
Ian is Jane's brother, lives in Ireland, and brings this exhibition, specially tailored for Bingley and The Bingley Gallery. 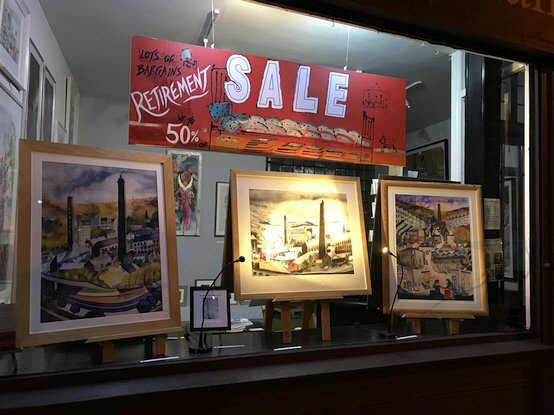 An irrepressible sense of humour, and an observant eye work together to create unique images of Bingley, in this exhibition of digitally embellished photos. 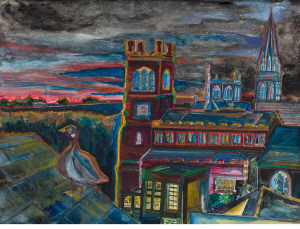 Jane Fielder's Northern landscapes go south. I am thrilled to have been invited by this prestigious London gallery. I will be showing a collection of new Janescapes , in my first solo show in the capital. Amy's first solo showing with us. She specialises in oil paint on canvas, bringing a vibrant rich colour to all she portrays. Industrial machinery, industrial landscapes, flowers, still life .. the range is wide and the style unique. Visit Amy's website to preview more. “I studied Fine Art and Art and Design at Leeds Metropolitan University and somewhere on route to finishing my degree I had my first son Edward who has just turned 4. 15th May - 8th June 2008 David Greenwood and Andrea Ellis "People and Places"
is a Bingley based artist working in Pastel. 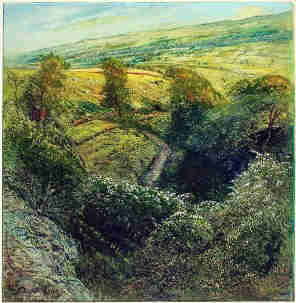 A professional of long standing, he has had numerous exhibitions throughout the country, is currently represented in several galleries throughout Yorkshire, and is widely collected across the world. 3rd April - 20th April 2008 Jane Fielder "Time to Reflect"
30th March Norman Bevan "Mainly Yorkshire Connections"
It is a great honour to be hosting a solo exhibition for Norman who has had work hung in the Royal Academy and the Paris Salon. Exquisitely executed landscapes and townscapes, in acrylic. With an eye for architectural detail, and a precise technique in acrylic, Norman brings a new, realistic but slightly surreal approach to his art. 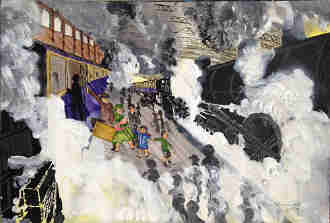 Emigration forces the owner to relinquish a collection by the late James H~ardaker (1901-1991). 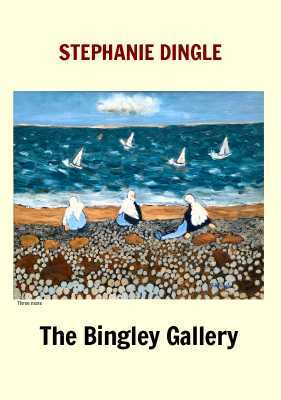 A rare opportunity to view and purchase work by an internationally renowned Bingley artist. …. from £5. Work by Jane Fielder, Chris Fielder, Amy Charlesworth and Gemma Hobbs. From November 8th, The Christmas Show, featuring paintings, hand made greetings cards and gifts to tempt the Christmas spirit. 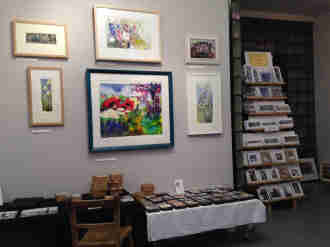 And in the upstairs space, a collection of Jane's Janescapes and prints; oil paintings of Orchids, Pots and Birds by Amy Charlesworth; And from Chris Fielder, delightful and evocative woodland scenes set in St Ives Bingley, as well as some of his more challenging work..
An honour to be asked to have a Solo Exhibition at this prestigious venue. Starting July 26th 2007 I'll have a New Collection of Janescapes on display. This is a new collection of original work. 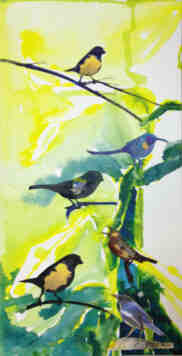 Some in watercolour as most of my Janescapes have been until now, and others in acrylic on canvas. I have been working on this for several months and am really pleased with the result. Do come and look! Until then, the downstairs gallery continues to show (mainly) “People and Places”, exploring people's interaction with their environment. 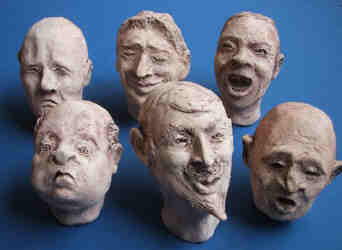 And as ever the upstairs gallery has a representative selection of my other work. Currently showing "The Joy of Spring", a collection of my flower paintings. 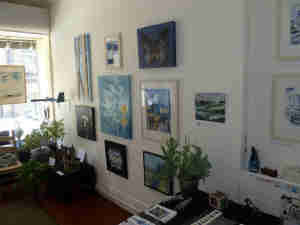 As well as a mixture of my other styles in the upstairs space. “A Race Against Time”, abstract paintings about life, rushing to do a million things at once and always running out of time, starts Thursday 19th April. The gallery will be open over Easter, Friday 6th, Saturday 7th and Sunday 8th. Closed Monday as usual. BIG Excitement. 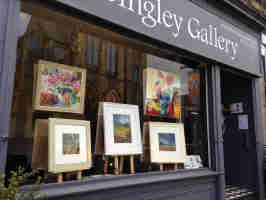 I have opened a gallery of my own here in Bingley, The Bingley Gallery. I opened on Thursday February 8th. Full details below. Do hope to see you there. I'll be showing my own work, and will be at the gallery lots of the time.